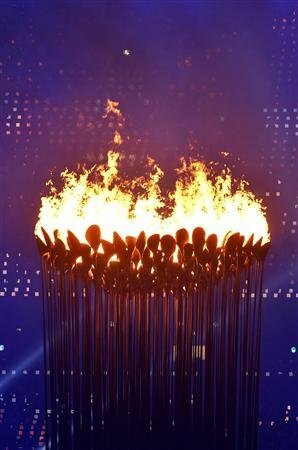 It is a terrifically poignant moment when the Olympic torch is extinguished. 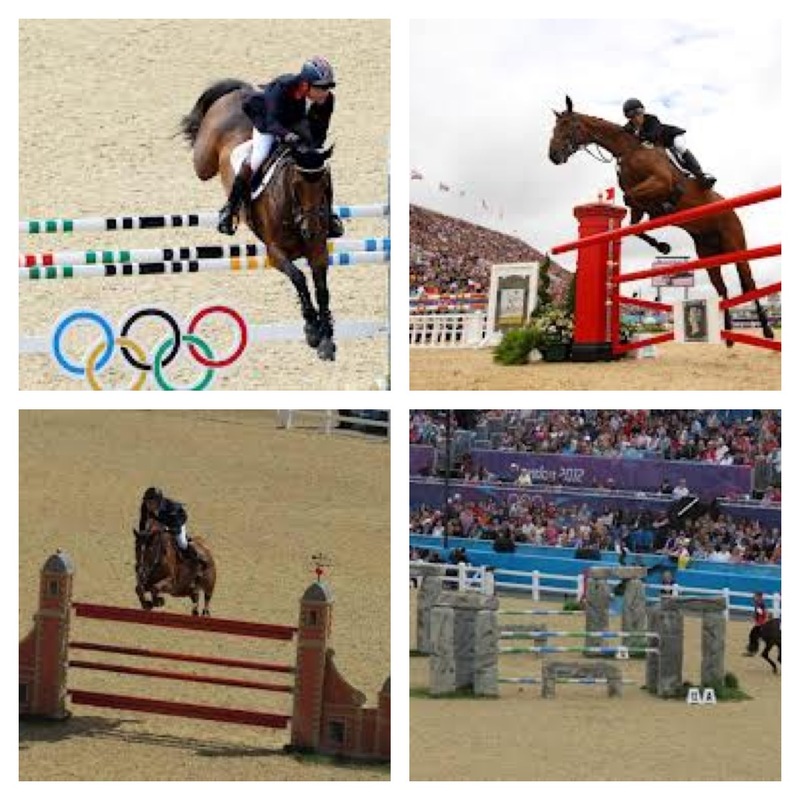 Sometimes it’s hard to imagine that the Olympics was only a couple of weeks of our lives. Yet it does and indeed should inspire a new generation and leave a legacy. 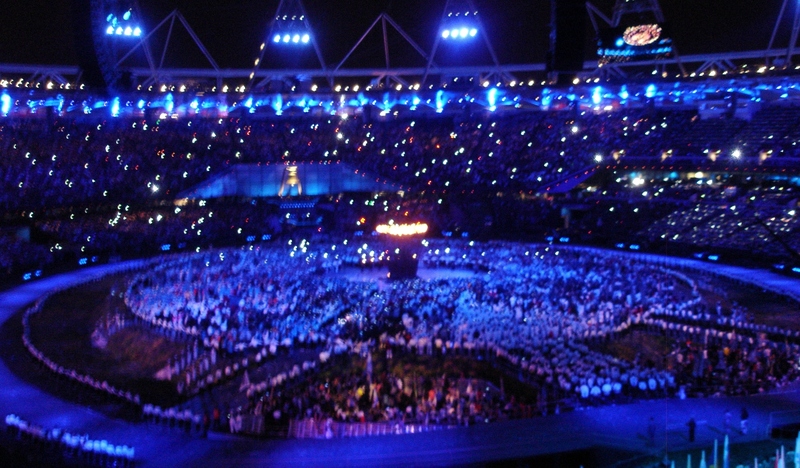 Millions of memories made for the attendees, the Olympians, the volunteers, those who watched it on the big screens, on their televisions, in Great Britain and overseas. What will you take with you from these past few weeks? The volunteers who have, at every opportunity, offered a smile, a song, a dance or the most practical of support. The armed forces who have kept us safe at every venue… and always with such welcoming and warm smiles and laughter. 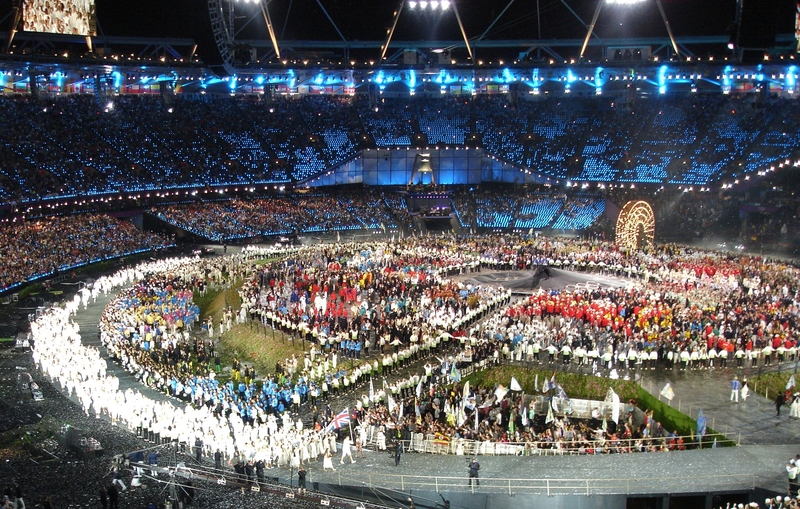 The volunteers who gave up their time to perform in the opening and closing ceremonies. 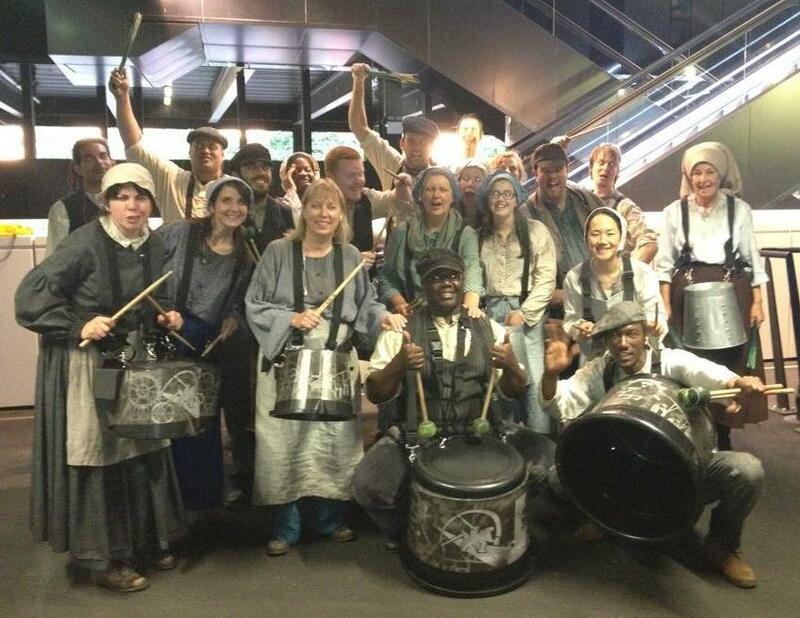 Their many many hours and trips to and from Stratford for rehearsals over many weeks. 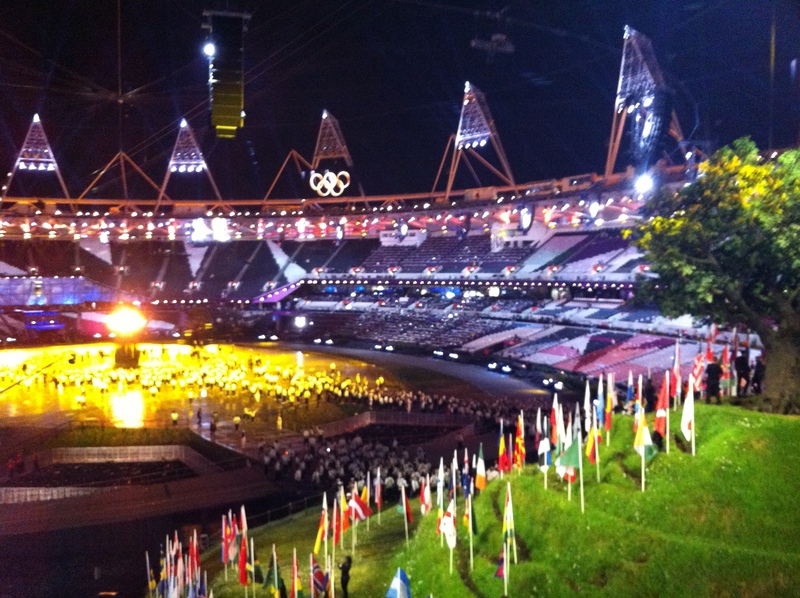 I’ve loved listening to people talking about the Olympics, the flags, the colour, the spectacle. 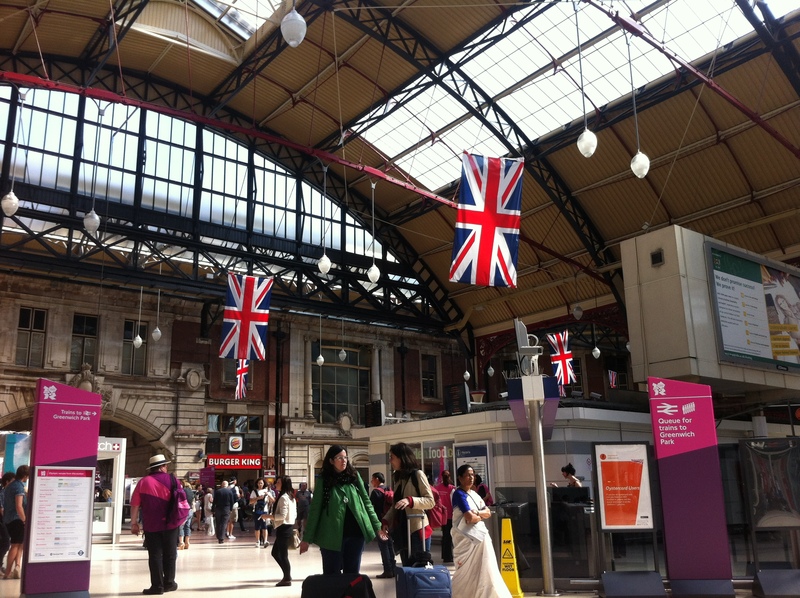 A little girl yesterday, sat behind me at the railway station, turned to her big brother and exclaimed “look the flags are dancing” (as they caught the breeze). As I looked up, they did dance too. I’ve always been someone who talks to strangers (yes I know I should have paid more attention to my parents when I was younger!). But I’ve loved that they don’t think I’m a mad bird on public transport but they engage in conversation. I love that people are excited about the Olympics and that people who are nearby join in the conversation rather than bury their heads in their book or look the other way! I love that it doesn’t matter what colour skin, age or ethnic group they’re from, we all chat together. I loved the Irish chap who was sat next to us at basketball saying that he looked forward to meeting us again during his time in London – perhaps an assumption that London is small enough to bump into him again but certainly one that had made him feel as if it was small and comfortable! I’ve loved that friends visit from overseas (from New York, Sydney and San Francisco) and I get to share the Olympic dreams with them. I’ve loved that Mum played her part in the opening ceremony with her picture being on the memorial wall and in the closing ceremony as they played ‘Look on the bright side of life’ which was a song she was adamant should be played (and was) at her funeral. I’ve loved being able to take my niece and nephew to Olympic events and creating memories with them that I hope will give them confidence and inspiration as well as in years to come they will tell their families and remember being there. I’ve loved that my brother came up to London and to an event with us yesterday and I got to hang out with him for the day and together create a memory or two. 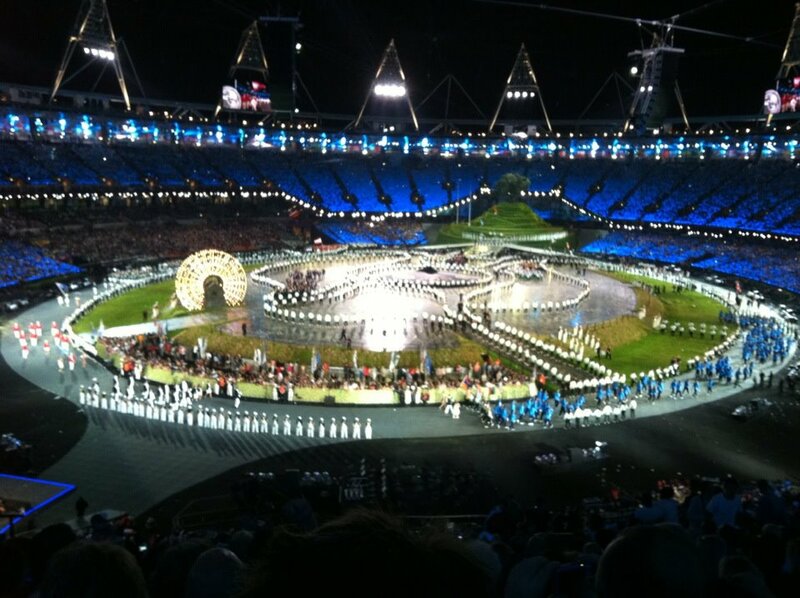 I’ve loved the laughter that has been a part of the opening ceremony (Bond 007 and the Queen), the closing ceremony, the volunteer drummers, the TV show Twenty Twelve and of course Team GB‘s and Tom Daley’s diving squad‘s YouTube efforts too! It’s great to know that we can still retain our sense of humour (even if a little wacky and odd at times) AND get on the medal table! I’ve loved discovering and rediscovering parts of London that I’ve not seen or visited in a while. Parts of London that are looking at their best. 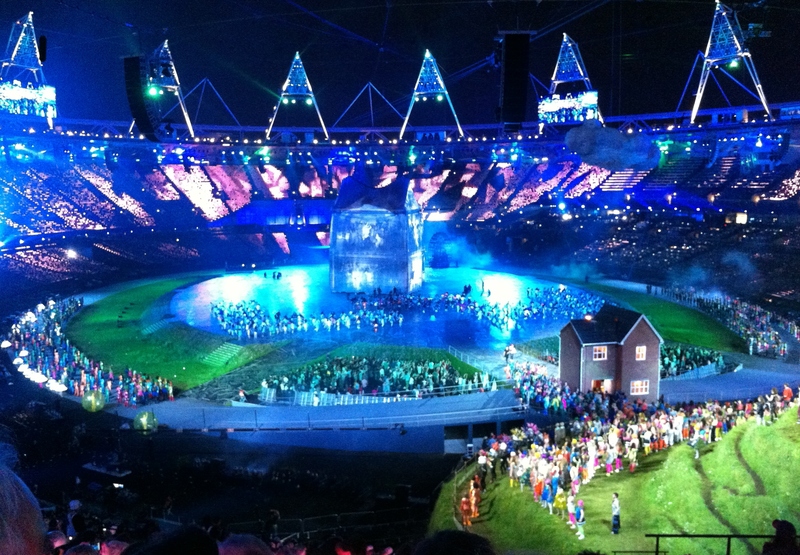 A London that is welcoming, warm and friendly…. and mostly covered in bunting! 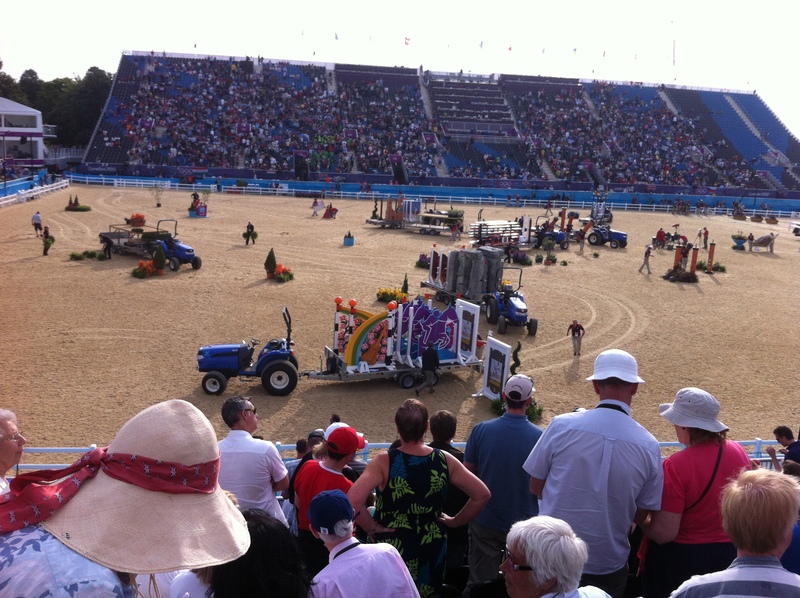 I’ve loved listening to people talk animatedly about the Olympics without swearing and bad language! 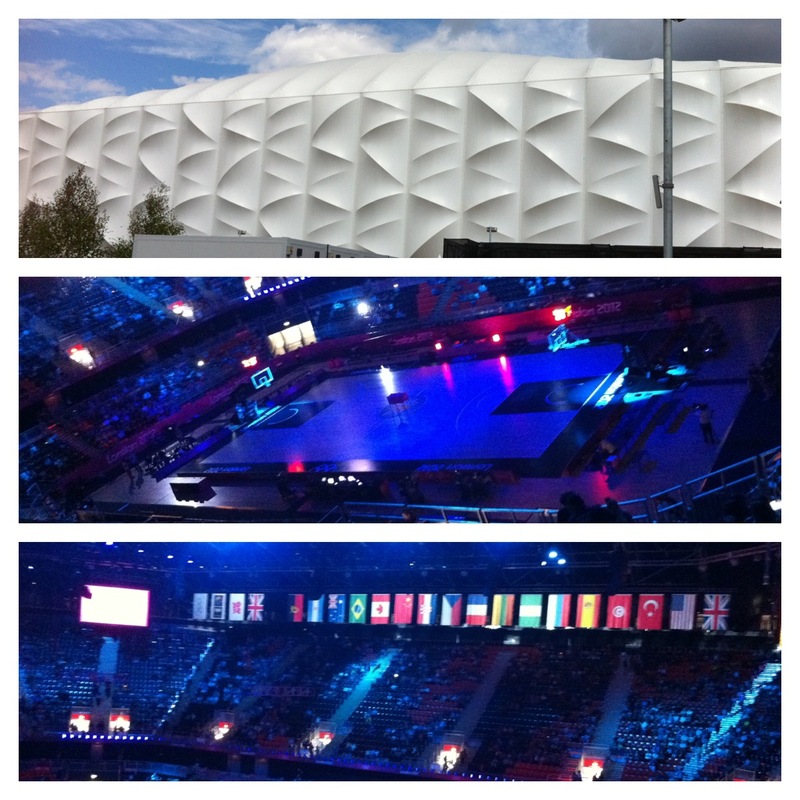 I’ve loved watching the Olympians at venues, on the TV and also listening to them in the background. I’ve loved sharing their ooooohs and aaaaghs as they do or don’t achieve their gold medals. I’ve held my breath and cheered them on. I’ve cried with joy and cried with disappointment. 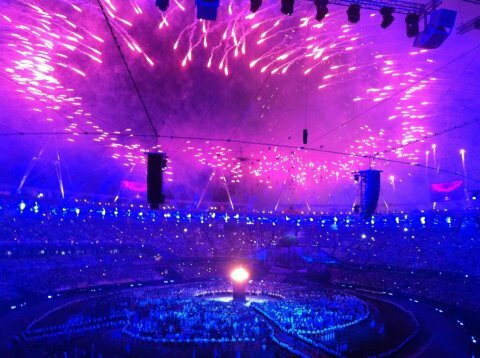 But most of all I’ve been proud to be British. I’ve been proud that London has shown the world that despite the doubters, we really can show the world a beautiful city, an inspirational nation, a winning mentality and a confident future. Thank you for allowing me to be a part of it. The past few days have been hectic and wonderfully full of laughter and cheers. My flat and garden has been full to bursting with guests from the US. 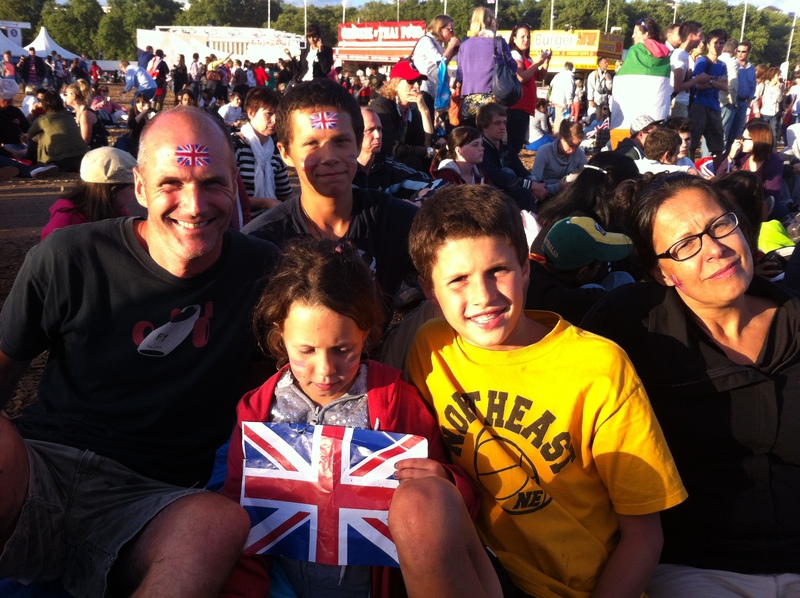 One of my oldest buddies and her family arrived on Thursday for a few days of London Olympic-ness. Jen together with her two youngest arrived in the afternoon. 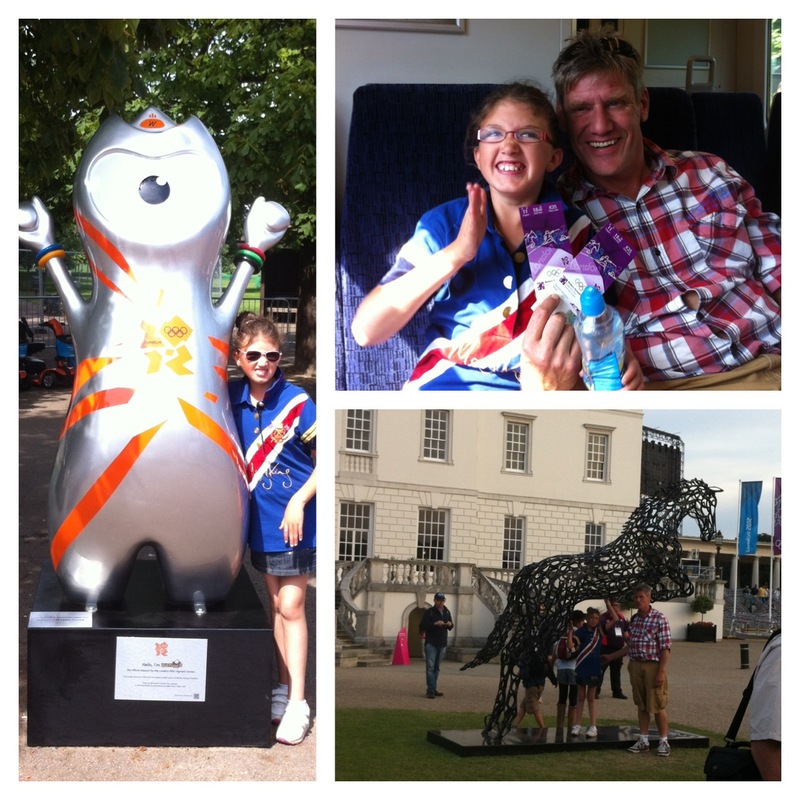 Her hubby and oldest had tickets to see the archery at Lord’s Cricket Ground and some hours later arrived full of stories and smiling from ear to ear. Ruby (aged 7) and I had spent the afternoon in the green shed painting pictures and preparing our own Olympic medals and Olympic rings. 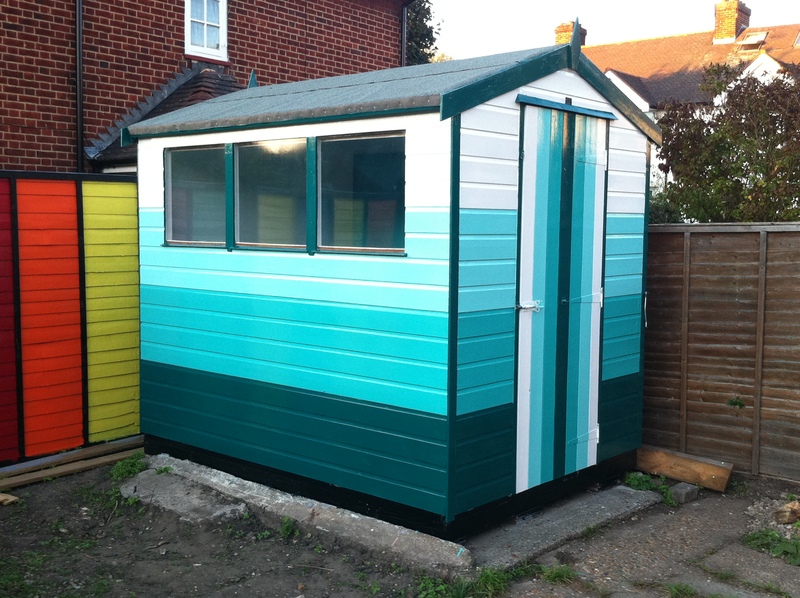 During our painting session, she was keen to persuade me that she could camp out in the shed for the night… to be honest it’d be a fab place for a good kip! When the boys got home, Jen went out to meet some friends and the kids, Spence & I had our own mini-Olympics in the garden. 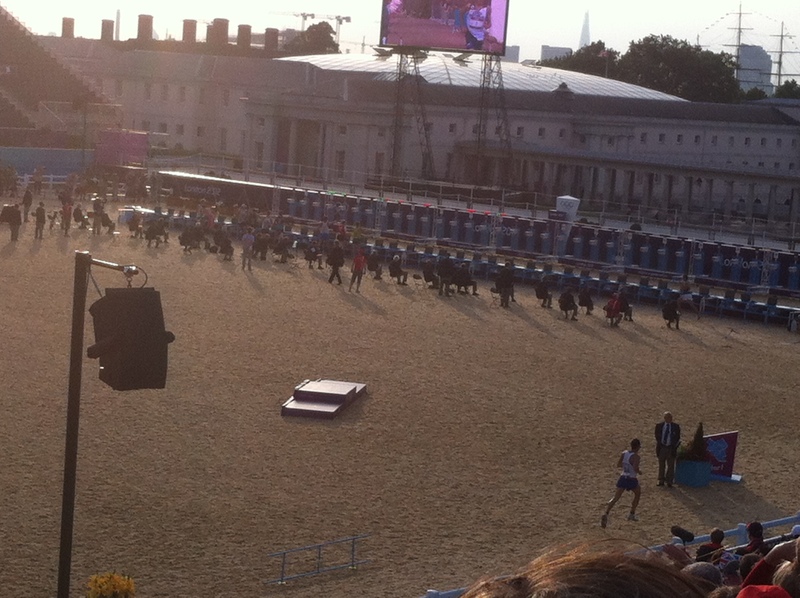 Watering cans held up the hurdles and the duck was a fabulous end point for the running race! Races were timed and a medal ceremony conducted! Ruby started the night camping out in the green shed, only to migrate to a pod in the tent an hour or so later. Dad, Spence, had the joy of being the ‘grown up’ and clambered into the huge tent when we’d finished our gossiping and viewed the BBC’s Olympic roundup. The oldest son managed to be sprawled out in the spare room so when Jen got home, ended up crashing in with me. Surprisingly we all seemed to have a good night’s sleep in our respective random locations. Friday, the family headed off to meet up with grandparents in the Southbank for lunch. 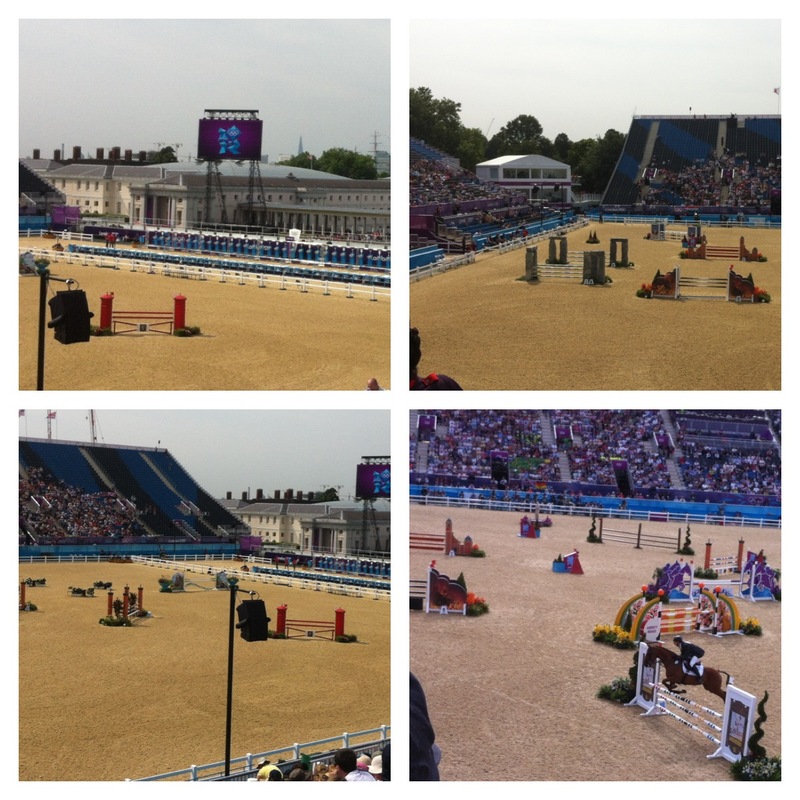 After lunch they explored what was on offer for London2012 on the Southbank and then walked across the river, up the Mall, through Green Park and to Hyde Park whilst taking in lots of Olympic venue sites together with London landmarks. Despite both parents being British, the kids hadn’t really seen much of London, so it was a great excuse to wander and explore. Ruby had said to me whilst we were painting that she really wasn’t sure if she was British or American. She holds both passports so which one should she cheer for? She decided it should be British first and American second! 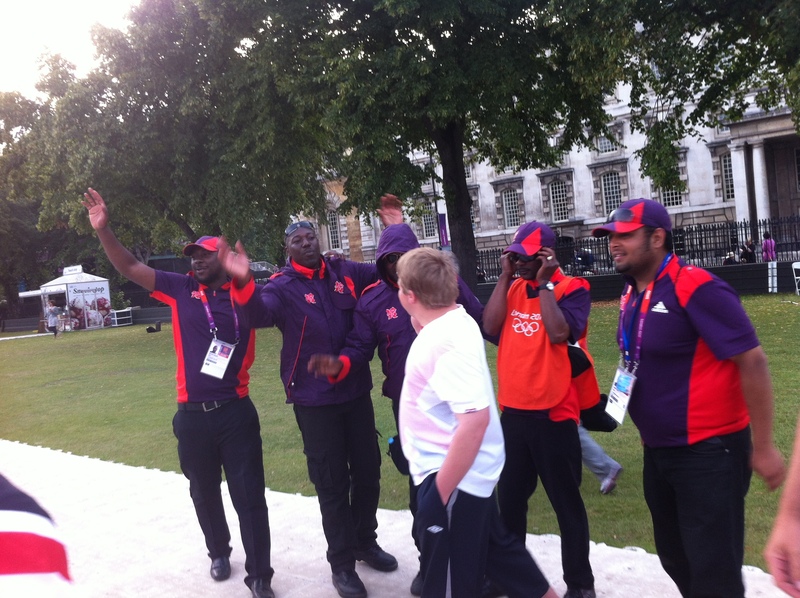 I met them later in Hyde Park at the BT London Live site where they were glued to the tennis on the big screen. I’d lent them a tarpaulin and rug together with some red, white and blue facepaint. 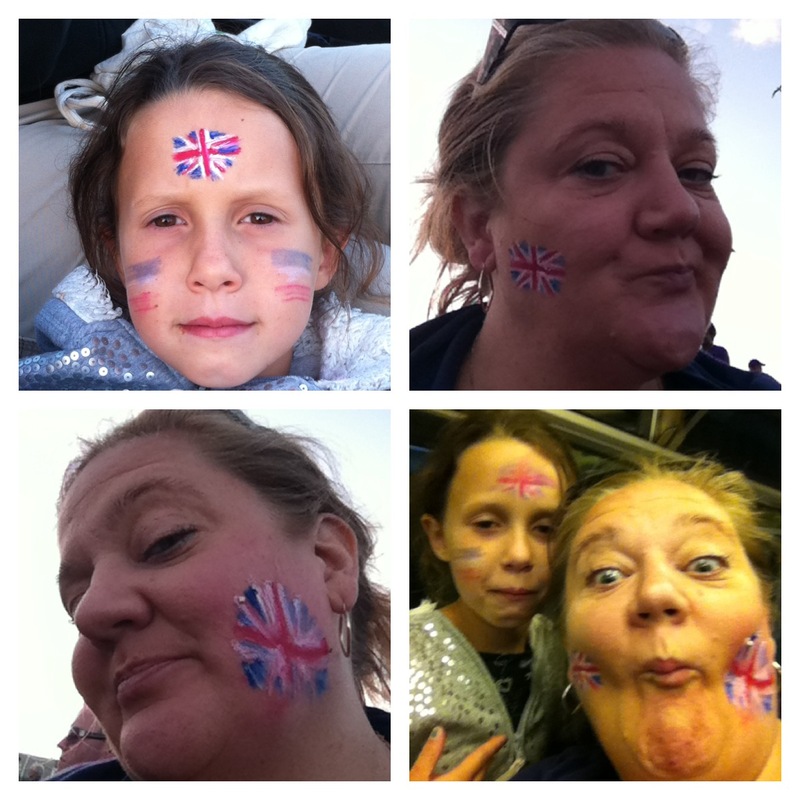 How fabulous to arrive and see Jen painting flags on faces…. British flags. 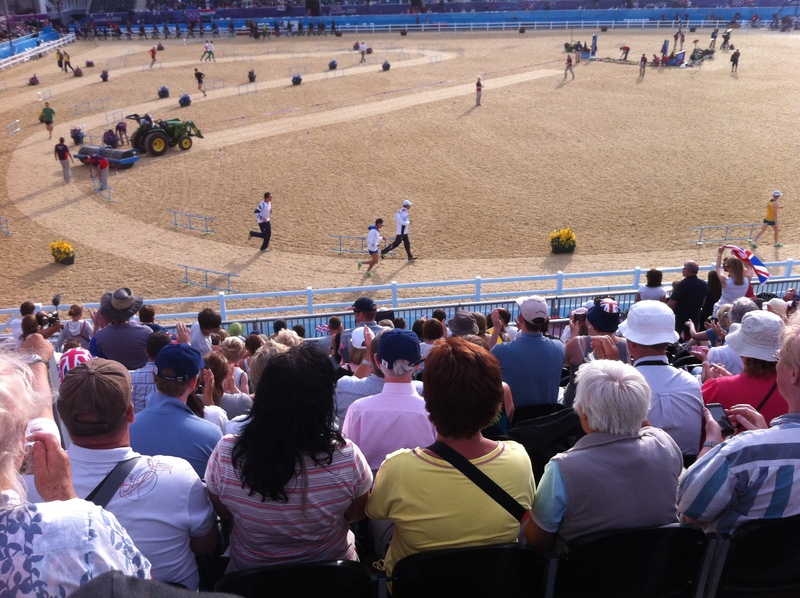 We had a ball watching the Olympics and cheering on with the crowds as Andy Murray scored point after point in his match. Saturday was a slow start… well until Jen and Spence found out that a tennis match had been postponed from Friday and that their tickets would get them to see the extra match. I dropped them off in Southfields at midday and they excitedly waved goodbye to me and wished me luck with the kids! Amazingly, they got to see the mixed doubles game with Robson & Murray -v- Storsur & Hewitt; then the gold medal match women’s singles between Serena Williams -v- Maria Sharapova; then the gold medal match men’s doubles between Bryan & Bryan -v- Llodra & Tsonga; and THEN the semifinals women’s doubles between Kirilenko & Petrova -v- the Williams sisters. What an amazing time they had and what a bonus being able to see so many fantastic matches. Needless to say there were a few phone calls during the afternoon asking if we were OK – of course we were… !! The kids and I had first headed off to a pub called The Telegraph in Putney Vale. I figured it’s a big pub with big screens showing the Olympics, serves good and reasonable food and was close to open land for running around. We had the upstairs all to ourselves which meant we could choose which Olympic channel to watch (the tennis) whilst we ate lunch and to keep an eye out for Mum and Dad on TV. Jake spotted them briefly. The pub is opposite woodland and a cricket pitch so after our main course we ventured into the woodland for a walk. We, of course, had another mini-Olympic wheelbarrow racing session on the cricket pitch too! Sometime later and with the incentive of ‘sticky toffee pudding’ which had been spied earlier by Ruby, we headed back to ‘our usual table’ in the pub and more tennis viewing with our puds. Once the bickering returned (hey you didn’t expect 3 siblings to be angels, did you? 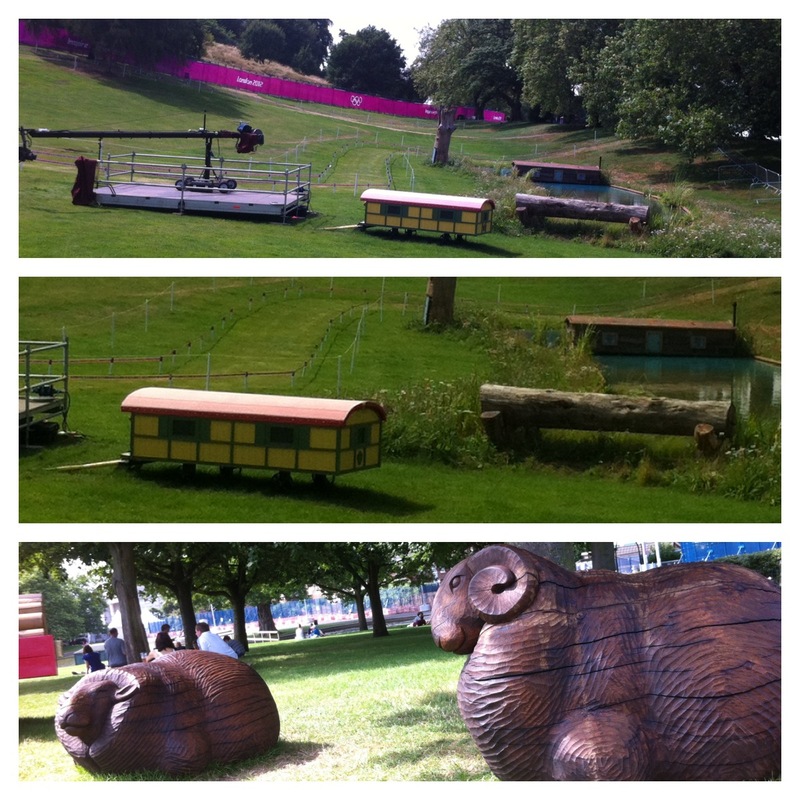 ), I suggested we find a park with some good climbing frames. A short while later, we did so and then could find me looking more than a little worried. The kids had created their own mini-climbing-Olympics timing each of them to clamber to the top of the wire frame. I can honestly say that I was more than a little nervous that as the time went on and they were getting tired, that a fall was going to occur. Oooh but each were determined to better the other’s score, they’re very very competitive! Anyway, no injuries were sustained and soon we headed home to get changed and ready to meet up with Mum and Dad for a curry dinner. I was sad to see them leave on Sunday but so very grateful to have had them to stay and spend time with them all. 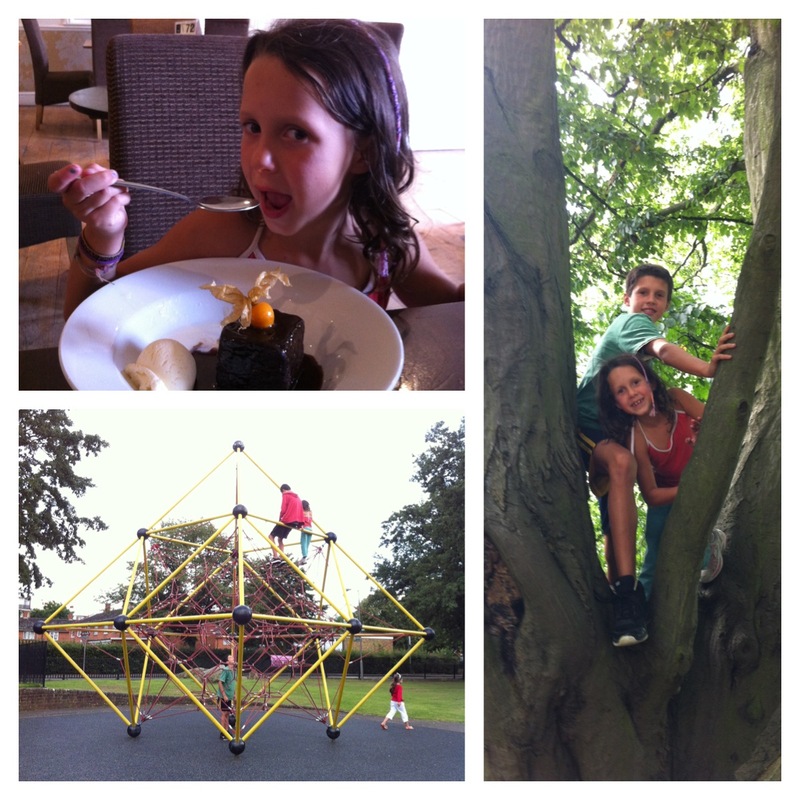 The kids (although exuberant and exhausting) are great fun and a joy to be around. I also cherish my times with Jen and Spence – just wish there was always more time to truly catch up. I’m not sure who’s more excited. JoeJoe, my nephew, or I? 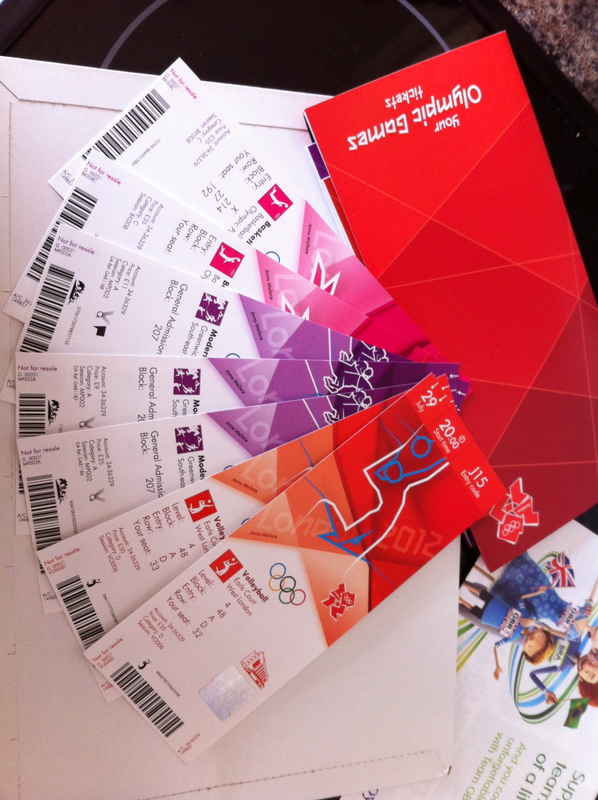 We’re off to the Olympic Park to see the Basketball. 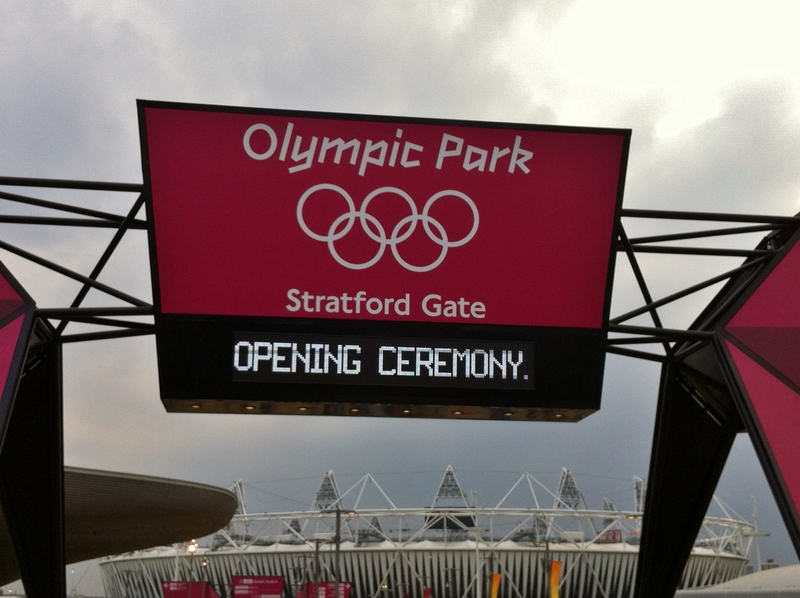 We headed there nice and early so that we can have lots of time to walk around the Park; immerse ourselves in the atmosphere; watch people watching sport; watch the big screens around the Park; find some lunch; spot an athlete; ooooh and just be a part of the 2012 Olympics together. 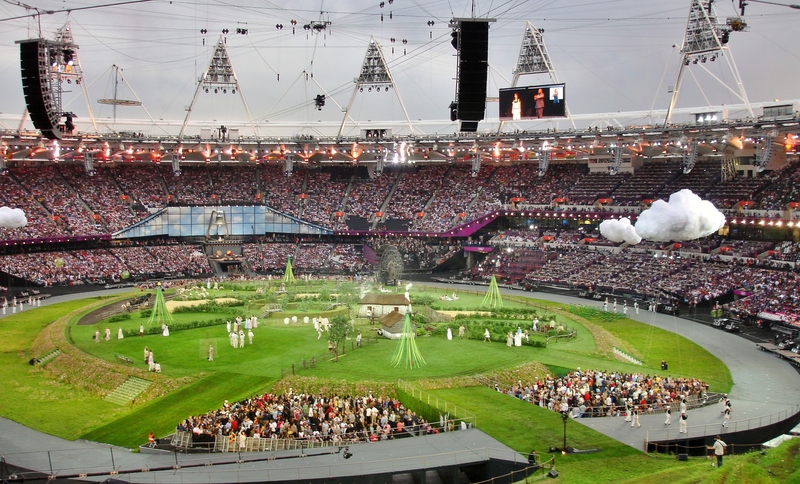 When I put in my bid for tickets for the 2012 Olympics I was determined that I should share the experience with my niece and nephew who live in England. 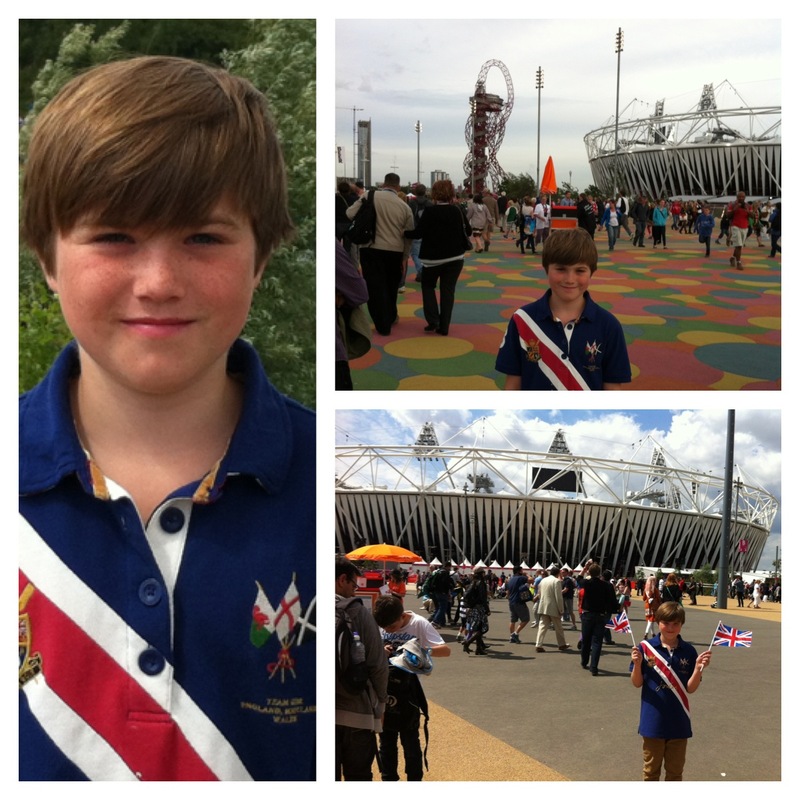 This is JoeJoe’s Olympic day with Auntie Anna. Our first game was between Australia -v- France. The teams were very evenly matched. Points scored by one team and then evened up by the other within seconds. Zinging from one end of the court to the other, back and forth. There were shots missed by both sides and amazing shots at other times. During the game both JoeJoe and I had questions and were unsure about the points, the scoreboard’s many numbers or the clocks around the court. Fortunately for us (and we had both read a little about the scoring and rules of Basketball) I was sat next to an Irish chap who knew all the rules and was able to answer our questions. Phew! Seconds left on the clock, still incredibly close but the French were in the lead, just, 62-65 – only three points in it. They took a shot and missed. The ball was caught by the Australians and they moved quickly up the court… if you’re able, do have a look at the closing seconds on this BBC video. If you’re unable to see it, let me explain. The Australian player, Belinda Snell, took the ball and threw it from beyond the half way mark, we all held our breath for that second as it headed toward the hoop, dropping in and scoring just as the game ended… 65-65 at full time. I only wish I’d had a camera ready to take a picture of JoeJoe’s face as he watched this few seconds from the edge of his seat. As the ball dropped, he turned to me barely able to breathe with excitement. The biggest grin on his face. and said “WOW”. Sadly, for the Australians, the extra time allowed France to recover and win the match 74-70. The second match was between Russia and Brazil. 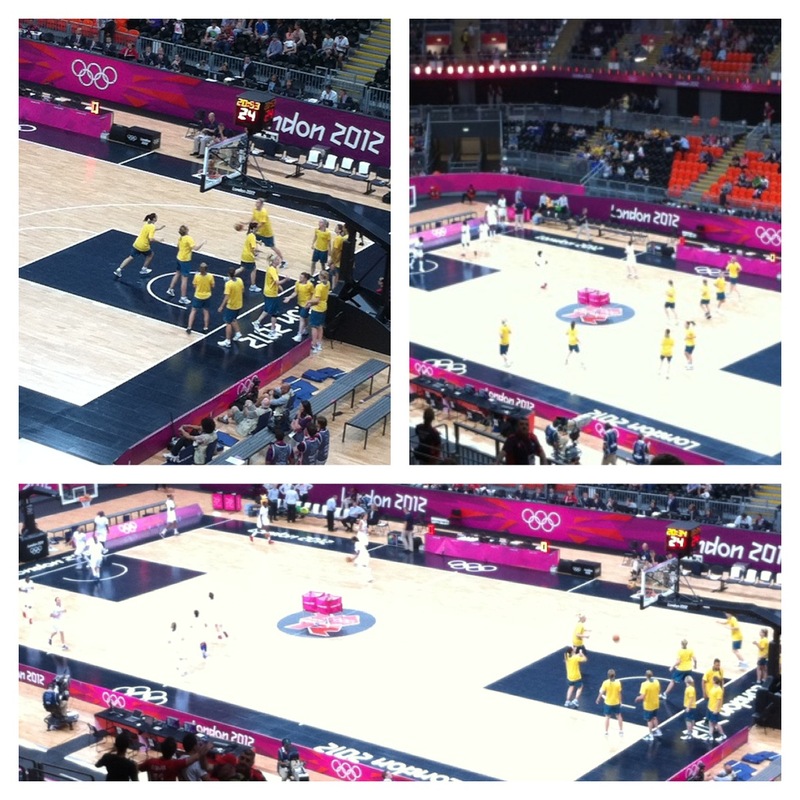 Again a great match with Russia winning 69-59. Aww and bless him, the Irish chap I was sat next to, as we left told me that he was in London until next week for the Olympics so looked forward to seeing us again! 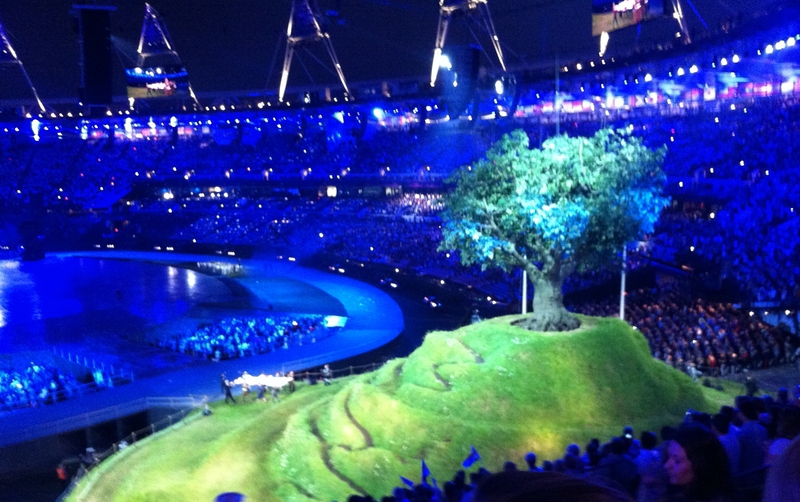 Hmmm perhaps in Ireland you bump into people but in London, during the Olympics…?? It did make me smile. What an amazing day and experience. 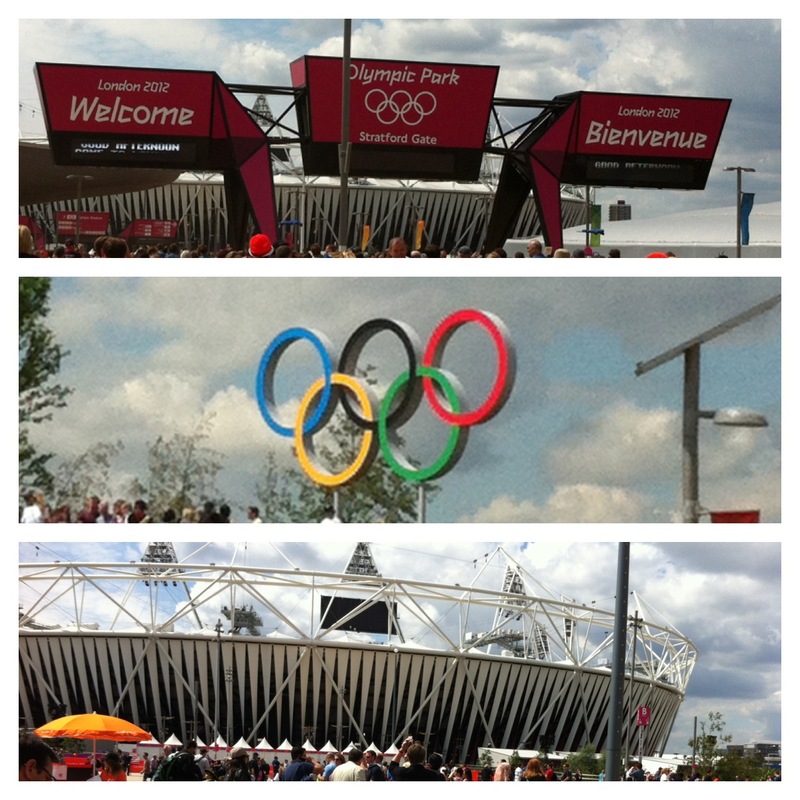 As we left the Park, we walked past thousands of others looking for and enjoying their Olympic experiences. So many dreams and aspirations. It really was truly inspirational. We then headed into town to Hyde Park to join my niece and sister-in-law at the London Live site watching the big screens with thousands of others. Incredible. H and I arrived a few hours early, as instructed in our many emails warning us of queues, traffic and transport problems, security checks etc. We parked half a mile from the venue and walked – we were about the only people on the streets so I did question if we’d got the right day! When we got closer to the venue, there were lots of fabulous volunteers and army chaps smiling broadly and signposting where we needed to go. Security was quick and painless however felt thorough and secure. We made sure to thank the volunteers and army officials for their time and care. We were in the venue nearly an hour early and managed to sneak in to watch the end of the match before ours – what a treat, we got a bonus game. 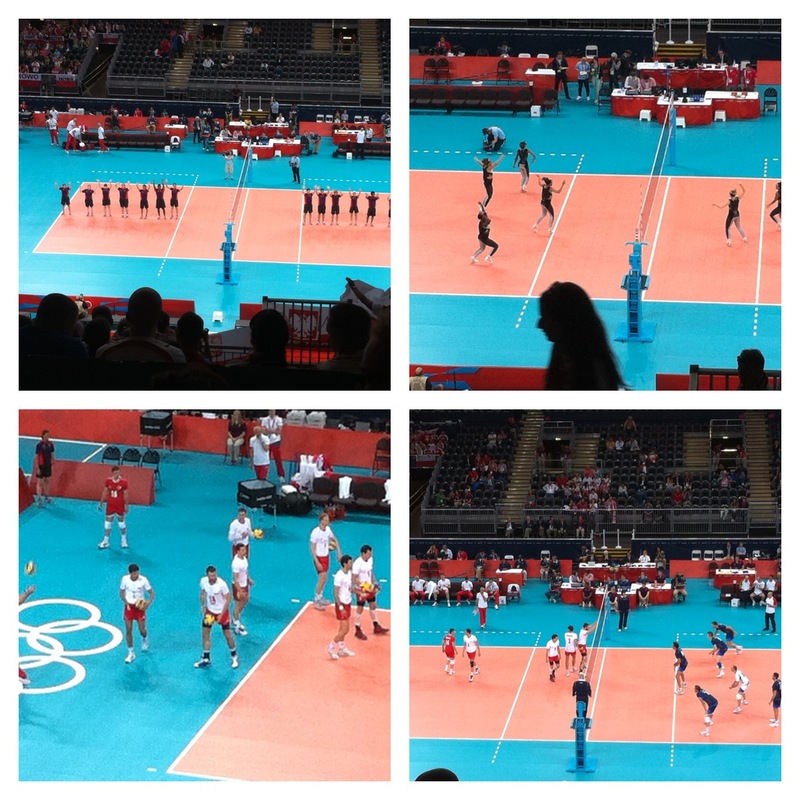 Our first match was Italy -v- Poland. I felt slightly sorry for the Italians tonight. 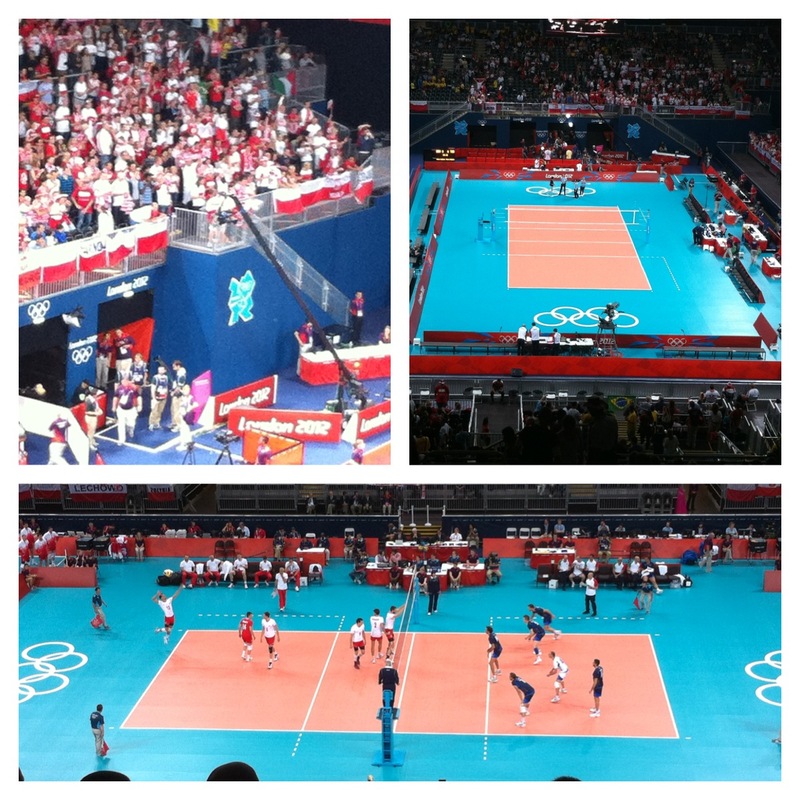 Playing volleyball in London 2012 against the Polish inevitably means that you’re supporters are going to be heavily outnumbered! The matches were fast and furious and the noise from the supporters equal to the play on court. 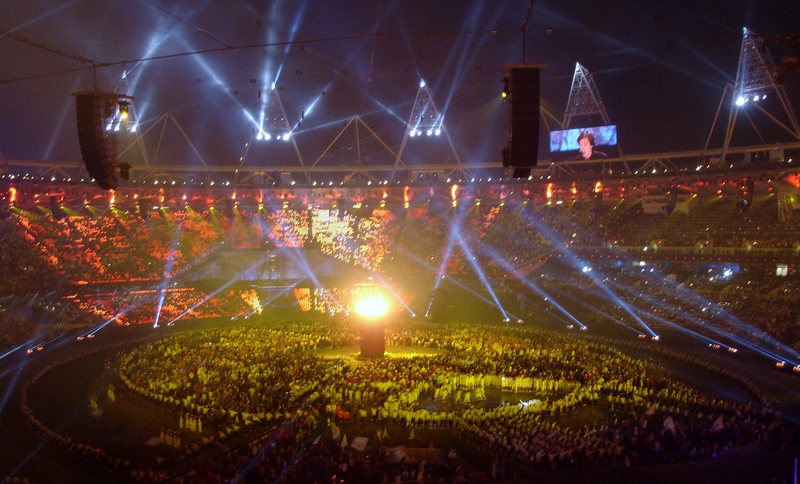 I loved being there and being a part of the Olympic spirit. I don’t truly understand all the rules of Volleyball but there wasn’t too many to understand or to get the hang of, or maybe I just didn’t need to to really appreciate and love the game and the experience. I was however slightly disappointed to hear the Polish supporters booing the Italians whenever they had the ball. Whatever happened to sportsmanship or just being quiet if you’re not supporting a team? The saddest part was that there were 5 young people in the row in front of us – quite clearly a mixture of people and I suspect bought along by a youth leader of some sort. They were so excited to be there and quite literally on the edge of their seats. Like me, they were supporting the Italians (probably, like me, because they had few other supporters there). At first they looked upset and angry that ‘their team’ were being boo’d and would turn around to see who was doing it. This was replaced later with boo’ing the Polish players – well that’s what we adults just taught them to do!!! Poland won this round 3 games to 1. 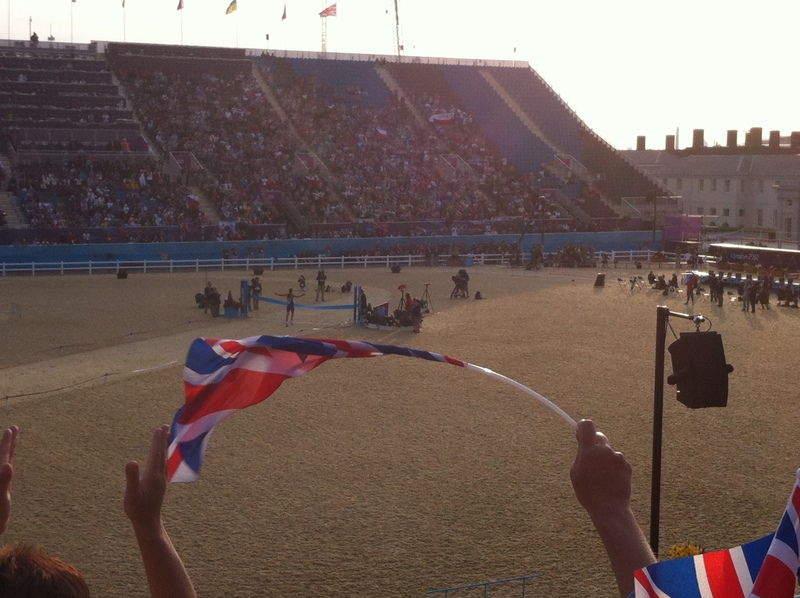 However a medal should also go to the volunteers responsible for keeping the court free of dust, dirt and debris. 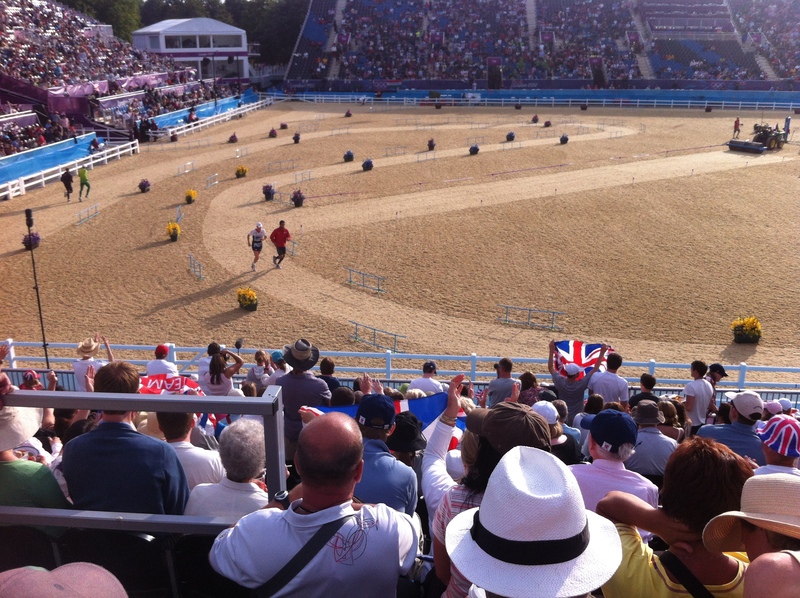 Their synchronised sweeping was second to none. I just couldn’t resist a little video of it either… enjoy! Next up was Brasil -v- Tunisia… to say that I felt the need to support Tunisia is as much an understatement as the need to support Italy. 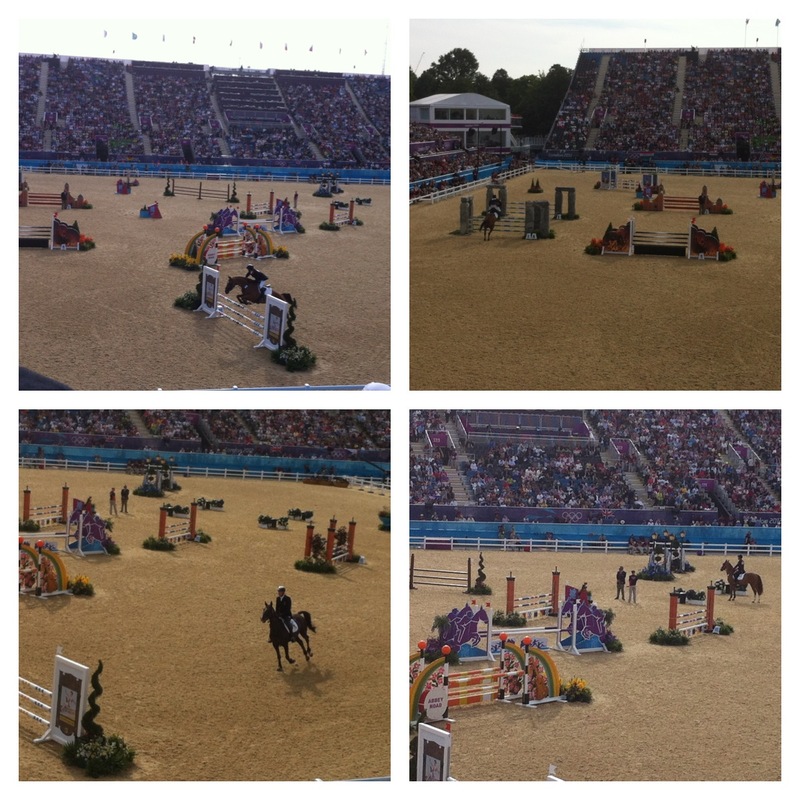 The Brazilians were out in force in Earls Court and yellow and green flags hanging from all available spots. Awesome game. Leaving the venue was as easy as our arrival. 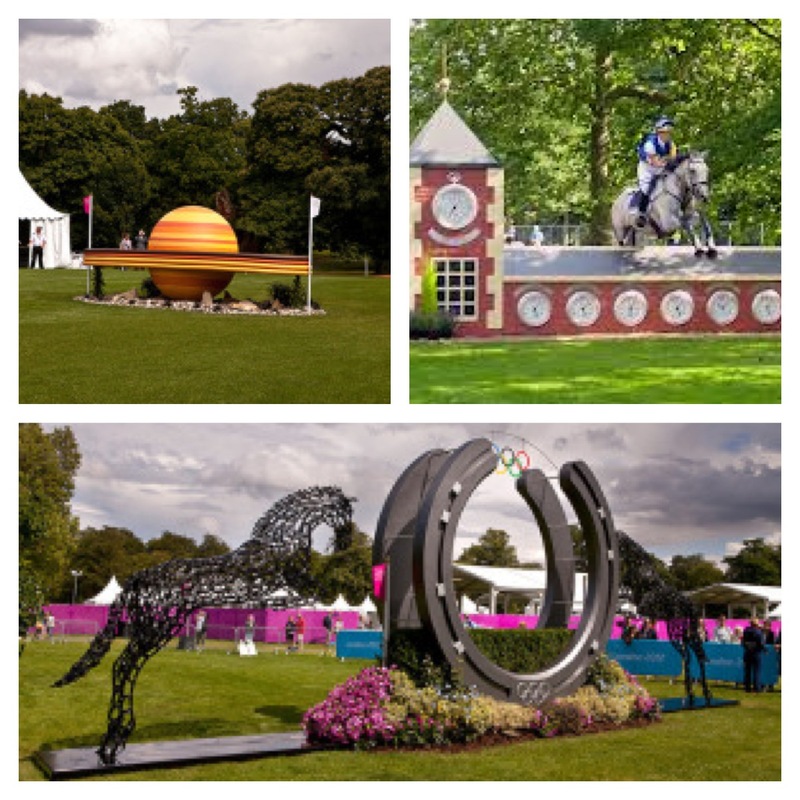 So very well organised throughout. The only part that wasn’t, was due to H and I forgetting where we’d parked the car!! After dropping H off, I headed home and was greeted by two very excited people. My nephew, niece and sister-in-law had arrived whilst we’d been at Volleyball. 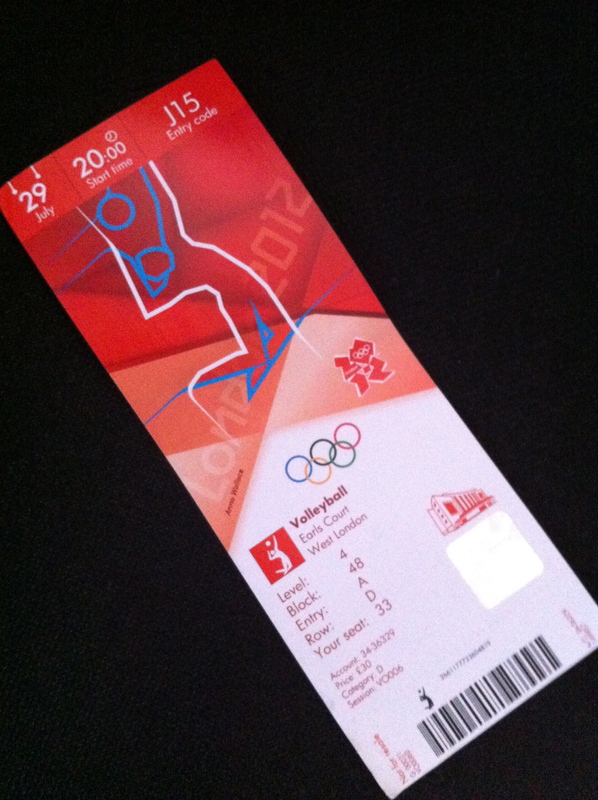 Tomorrow, my nephew and I are going to see the basketball at the Olympic Park! 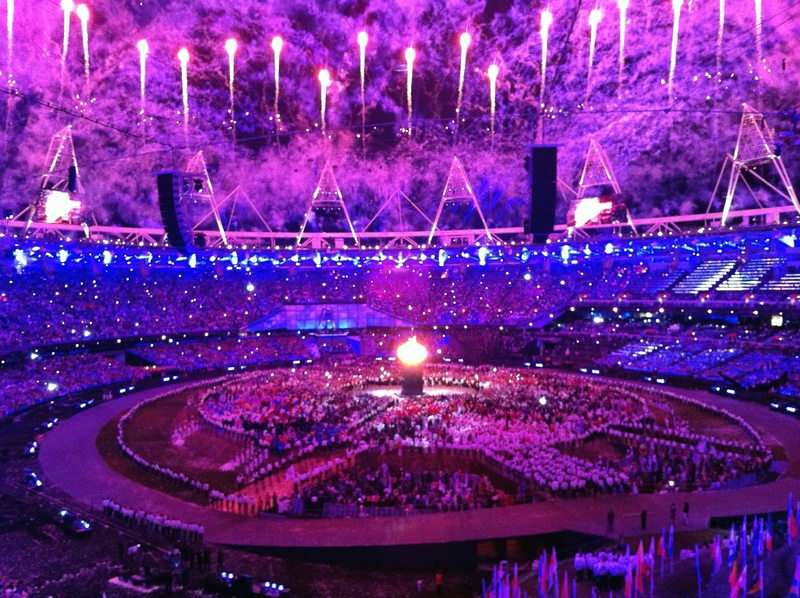 The national pride was palpable during and after the Olympics Opening Ceremony in London. Before the event however there was the usual ‘niggling Norman’ comments about it costing too much, about it going to fail, etc etc. I had faith that that really would be awesome and worthy of being called “the greatest show on earth” (although a part of me thinks it terrifically arrogant to give it that title before it has even taken place). I was not only NOT disappointed but even my expectations had been exceeded. It was awesome. 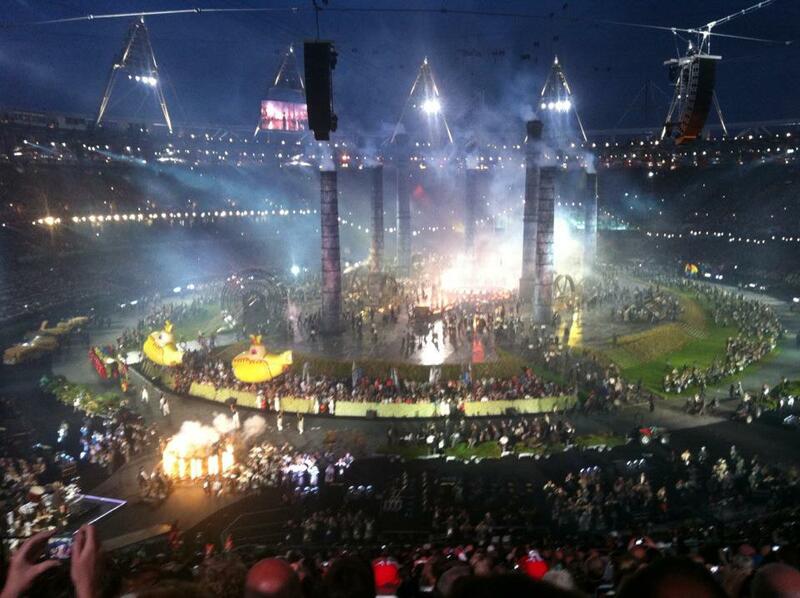 On the way home, the words that stuck out in the crowd were Queen, Bond, Mr Bean, Cauldron, Fireworks! Everyone was talking about it. 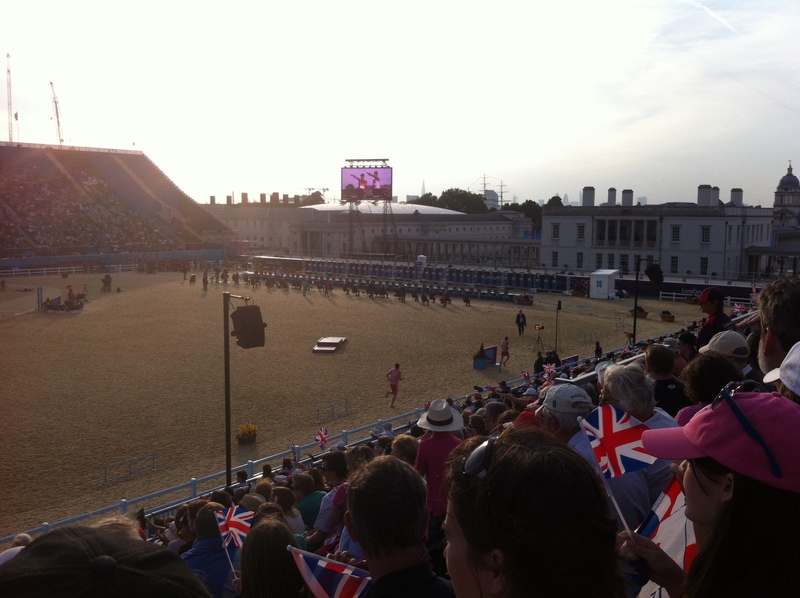 Matt and I chose to see the ceremony, at the last minute, in Hyde Park, amongst thousands of other people. 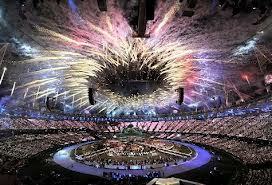 We both said that we should have known better and ‘invested’ in tickets to the Olympic stadium but hadn’t. You see both Matt and I were in Sydney for their Olympics so we KNOW how amazing it is to be part of something so momentous. I arrived suitably early at Hyde Park and after a fairly lengthy queue for security measures, I was in and able to get a place from where we could see the main stage and two screens. Tarpaulin laid out and plot secured – I had a little nap in the sunshine whilst waiting for Matt to arrive after work! By the time the concert started the park was full, the atmosphere electric with excitement about what was about to unfold at the Stadium and in Hyde Park. We were treated through the evening to live performances from Paulo Nutini, Duran Duran, Stereophonics and Snow Patrol. A wonderful sample set from each artist but cutting to the Stadium for the greatest show on earth. People were dancing and singing along to a band and then suddenly quiet would fall on the Park whilst people stood on tiptoe or jossled for a little bit more space to see one of the many big screens and listening to the Olympic show. Every now and then there would be a cheer, a round of applause or laughter heard from us and then falling silent to listen again. 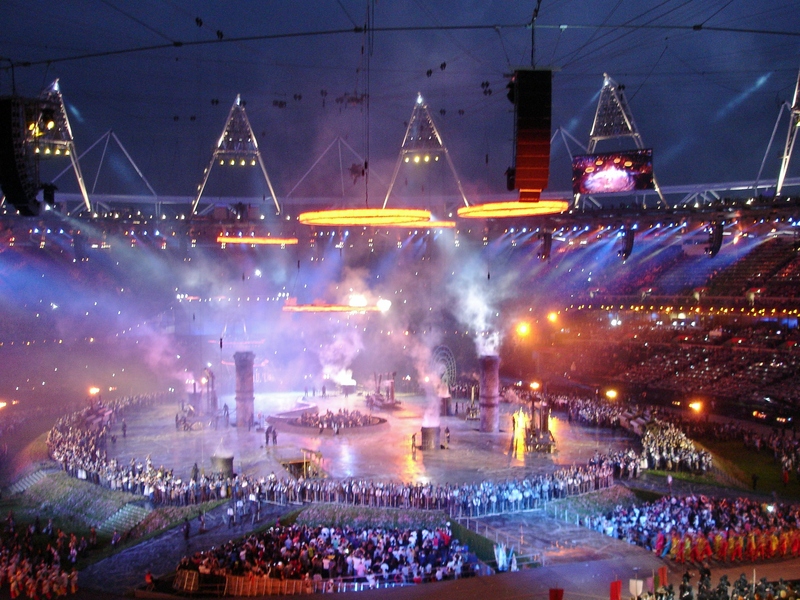 I can only imagine that the first part of the show (the industrial revolution) would have been both visually and audibly incredible in the stadium. The sound of the drums being the background to the visual. 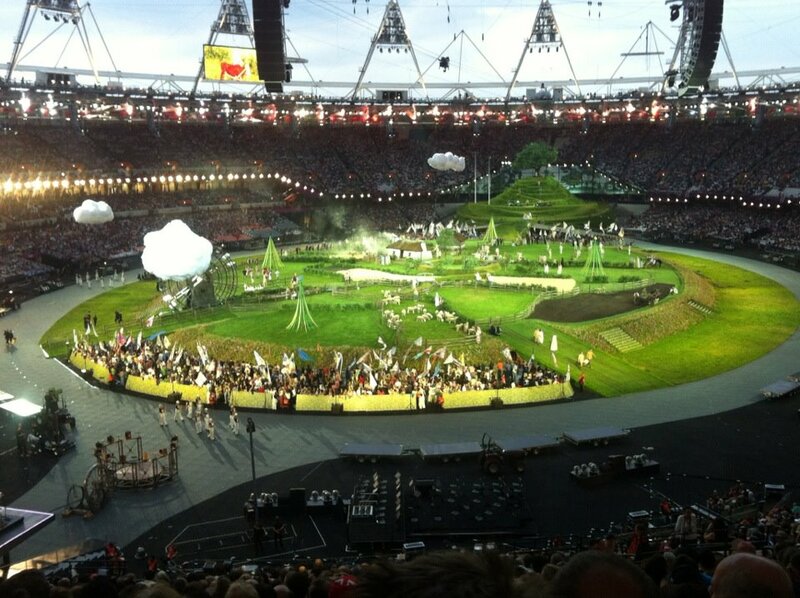 The humour that was injected into the spectacle AND that the Queen took part in it too! For all the criticism that is often lauded at the Royal family, I can honestly say that her agreeing to be part of the Opening Ceremony and seeing the Queen and her family in this the Jubilee year, has been eye-opening… and I’ve even heard people who ‘don’t approve of the Royal family’ actually be kind about them and the work that they do! Did you see it? 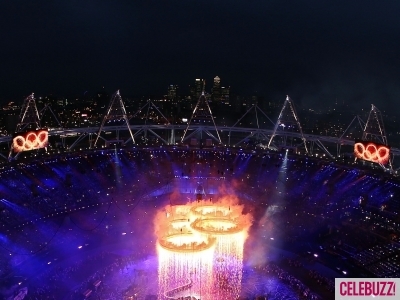 If not, do google or YouTube search for the London Olympics Opening Ceremony. 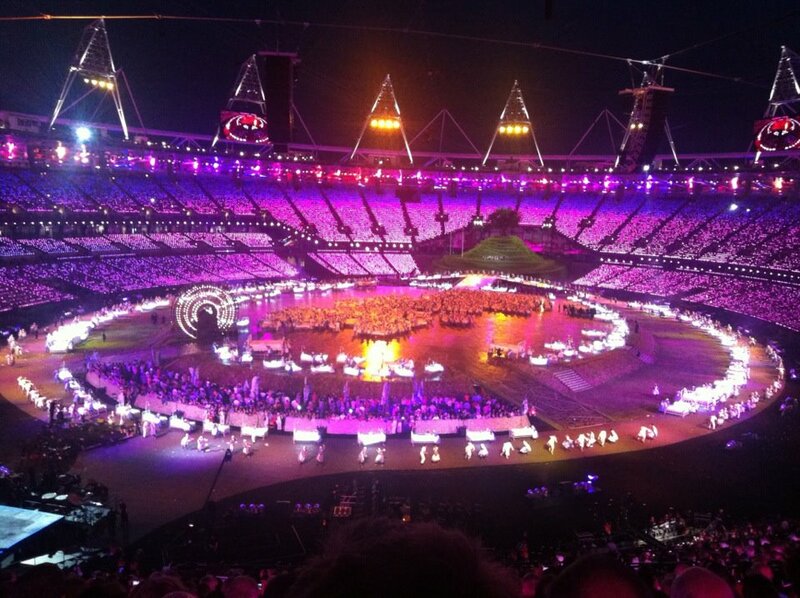 Truly a spectacle. I love that there’s so much secrecy surrounding the event. 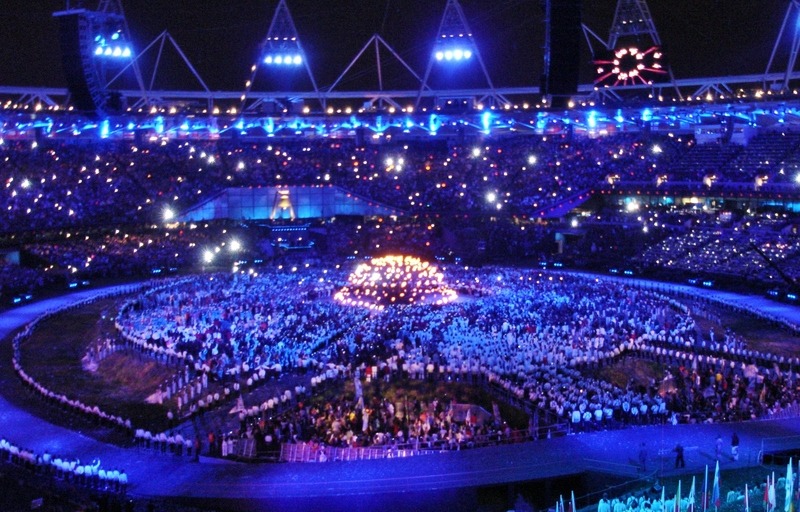 I love that everyone who participated (mostly volunteers) gave up hundreds of hours of their time and schlepped back and forth to London to rehearse… because they wanted to be part of a piece of history and to show the World how it should be done. Enough from me. It was incredible. 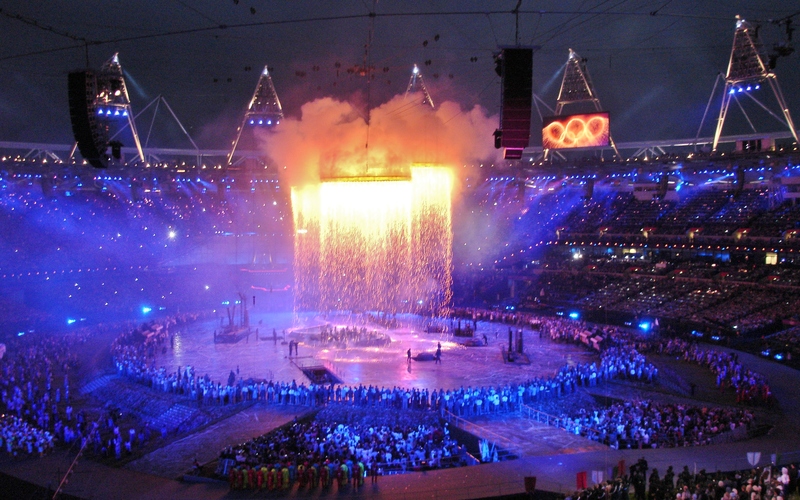 Danny Boyle played a blinder with the show, the pageantry, the spectacle, the lighting of the cauldron, the inclusion of so much humour but most of all reinforcing the Great in Great Britain! 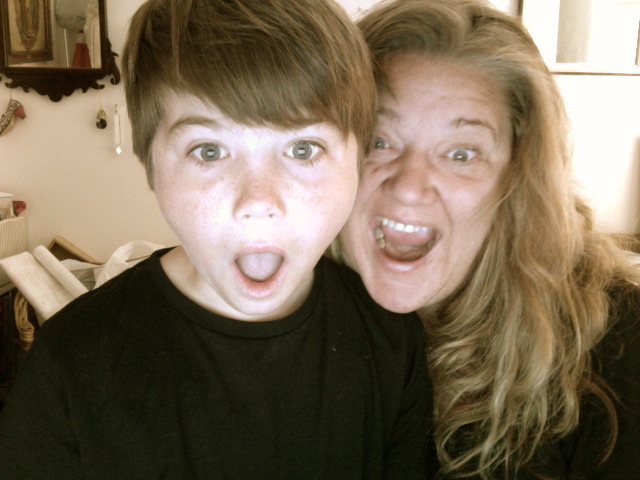 Oooh now let the Games Begin…. I attended a meeting at the Maggie’s Cancer Caring Centre in London this evening for volunteers. As you know from previous postings I have been a volunteer at a number of events for Maggie’s in this past year. Some of them are collecting donations, such as the Walk the 38 or Golf Live events. 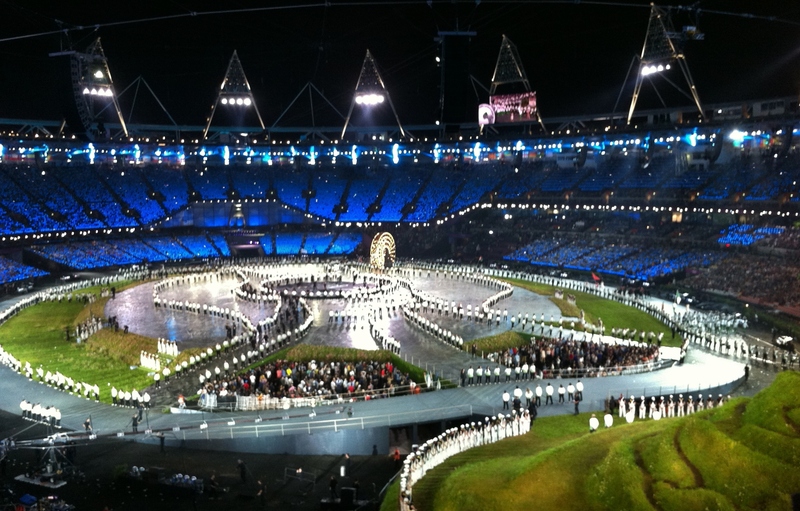 Others simply representing the charity and being part of the Olympic Stadium parade. Charitable organisations always need volunteers. People who understand their organisation, what they do and why. To speak with members of the public, promote their services and advocate their work. For me, volunteering for Maggie’s is a no-brainer. I can’t endorse more fully what they do, what they stand for, their methodologies, ethos and care for anyone affected by cancer. For their adaptable spirit that enables people at different times with different requirements to be supported by this organisation. I have known and know people supported through their Glasgow, Edinburgh, London, Oxford, Hong Kong and Cheltenham centres. I’ve yet to hear a bad word said or a comment about their not being there or knowing what is required and when. Truly amazing and I would urge you all to have a look at what they do, tell others about them and if you’re nearby to call in and understand each of the Centres. Tonight several volunteers and Maggie’s staff got together to brainstorm about ideas for future fundraising events and volunteer roles. 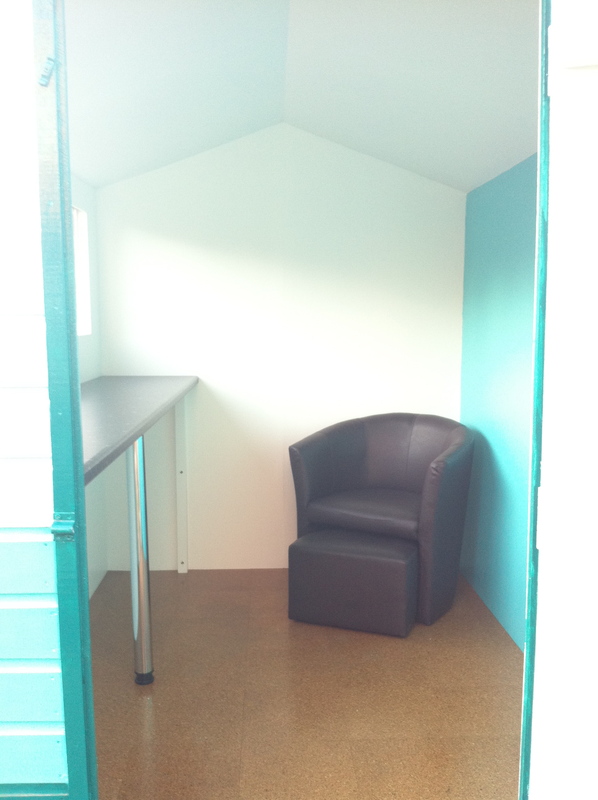 We recognised that the volunteer roles take many forms. Some physical attendance such as the events I’ve done previously. Others to review leaflets or newsletters etc. Perhaps to contribute by sharing your experiences. Also volunteering services to talk about the Centres and the services. Promote their organisation. As I’ve said before, I do this all the time and will continue to do so. If you can, do get involved or take the time to find out more about the centres and why I think they play an important part around the World in supporting people affected by cancer. But volunteering doesn’t have to be for Maggie’s… I’m sure you’ve got organisations, charities or causes you’re passionate about. Do think about getting involved… they all need volunteers. Of if you’re not sure who’d you’d like to volunteer for but perhaps have some time on your hands, want to get involved or even need work experience, then one of the volunteers said this site, Do-It Volunteering Made Easy, is a great place to find organisations needing volunteers – at home and abroad. The buzz I feel when I volunteer for Maggie’s and the other charities and organisations with whom I work/volunteer/speak, is enormous. I know I give up lots of my time (some people say too much of my time) but what I get back is way way way more! 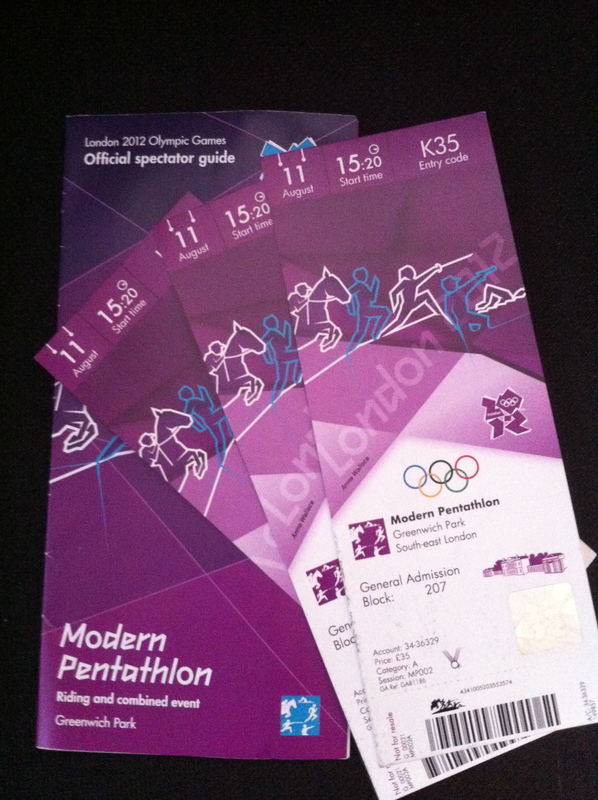 Today proved to me that I’m not actually the only person in the UK that’s excited about the Olympics. 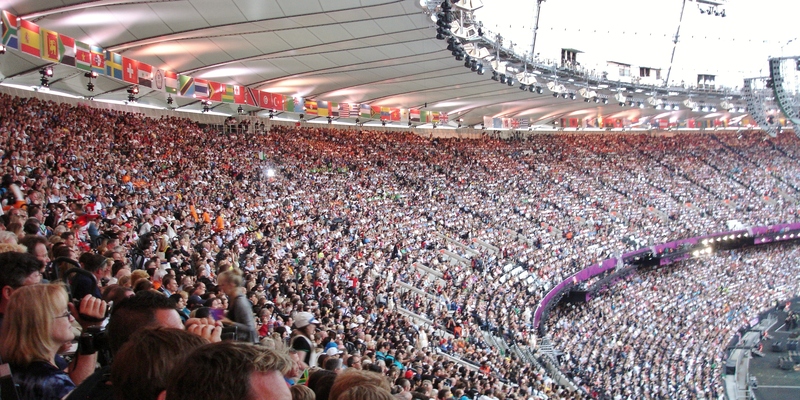 Although if you were to read the newspapers, watch the news or partake in any social network, you might well think that the Olympics is a bad thing. I’ve heard many reasons why it shouldn’t happen. What it’s costing, whether it should happen in a time of austerity – hate to mention that when the bid was won and the plans started, when we weren’t in this state! Whether it’s going to benefit anyone? Why wouldn’t it encourage and enthuse a new generation (and older generations) that you can participate in new sports, you don’t just have to play rugby, football or cricket! Oooh and perhaps it might get a few people off their butts and doing something physical… isn’t that going to save our NHS a fortune over the coming years? The transport’s not going to work and everything will take ages. Hey doesn’t it always (no matter which country you’re in) but put on a smile, talk to your fellow queuers and join the party… the time will pass much faster! 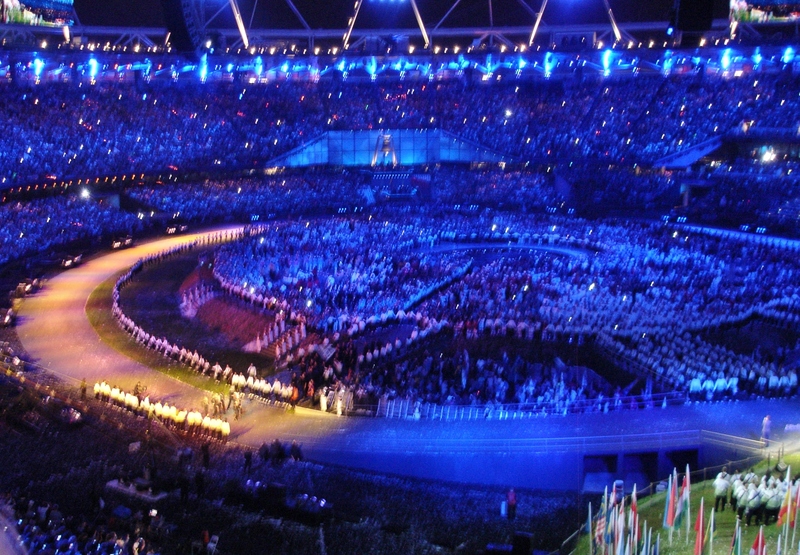 Support your olympians and paralympians in their epic adventures over the next few weeks. I know the security seems to be a little bit awry… but if you see anything suspicious it’s also your responsibility to act! AND now we’ve got the lovely men and women from the forces who will be looking after us – quite frankly I will relish the opportunity to thank them for everything that they’ve done and continue to do… on our soil and abroad. BTW, we’re under budget too. 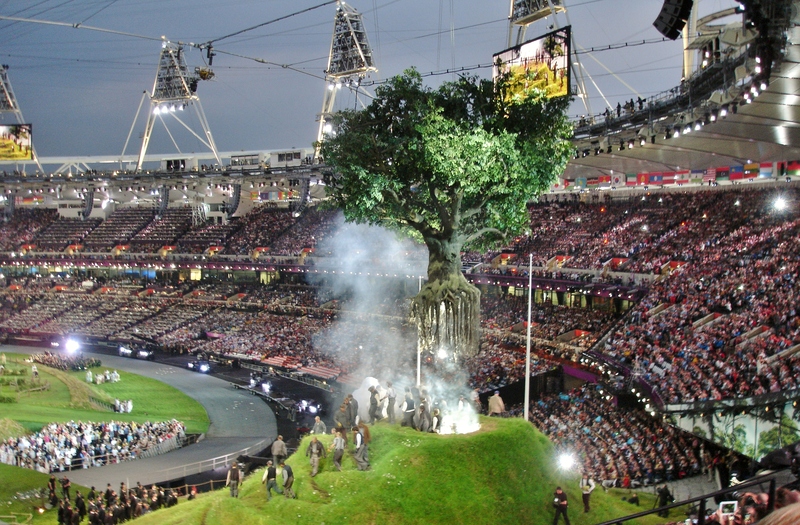 Oh and it gives us a chance to show the world that London, England CAN do something well (apart from having a Royal family and raining a lot). So stop the niggling Nigels/Nellies out there and turn yourself into positive Peters/Pamelas. Embrace what IS happening. Participate in the Olympics. Get excited. Get your family and friends excited. 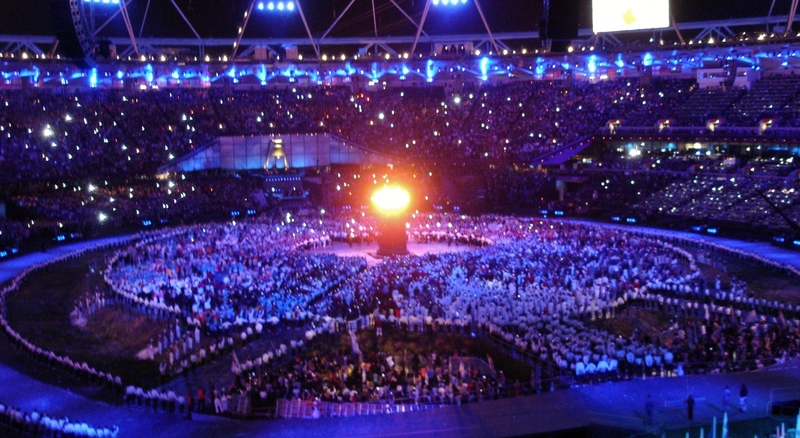 I’ve just returned from seeing the Olympic torch travel through Wandsworth. Whilst we stood waiting for it to appear, there was lots of chat amongst the waiting crowd. Children looked expectantly along the roadway, some having dressed for the occasion in costumes, facepaints or waving flags. This is the start people… get behind it and love it – I promise you, you’ll reap the rewards by being a part of it instead of whinging about it! 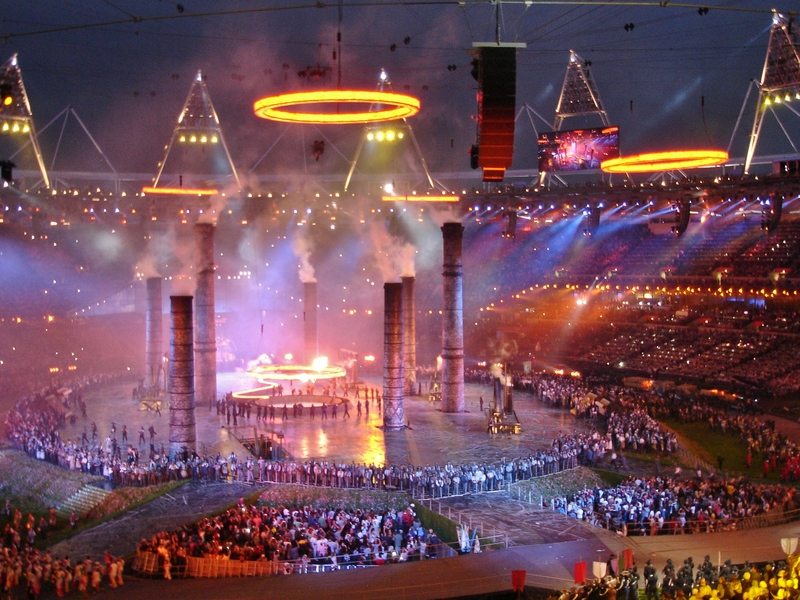 I am very very excited about the 2012 Olympics being in London. Woah, I can hear the sharp intake of breath from the readers here… or perhaps the confusion? No really, I am. If you believe everything you read and see in the media, I’m the only person who IS excited however. 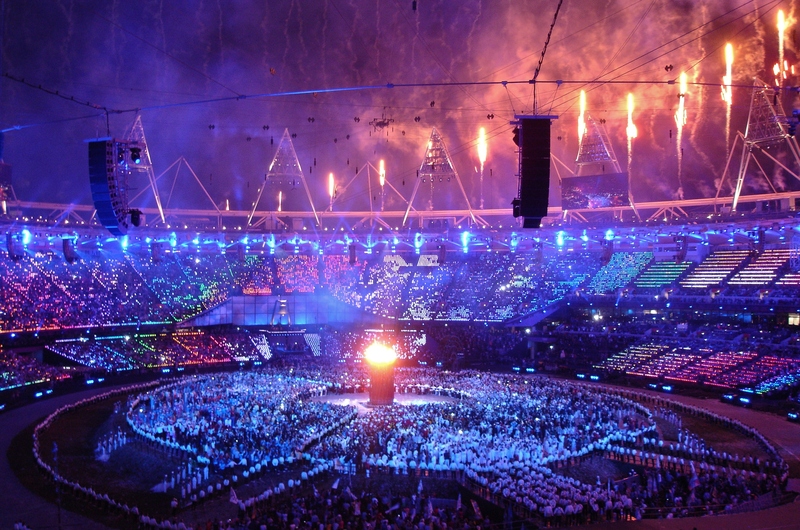 Despite what’s in the press about the cost, about the transport, about the _____ (fill in the gap), I truly truly believe that hosting the Olympics will be fantastic for the UK. I also believe it will be (or should be) an inspiration to this and future generations to know that no matter what, you can achieve your dreams. You can do it. You do have the confidence and capability to do ANYTHING you put your heart and soul into. I’m not sporty (or not these days) nor do I watch a great deal of sport or know all the rules. What I do love about sport though is the ability to work as a team or in solo sports the determination and drive. 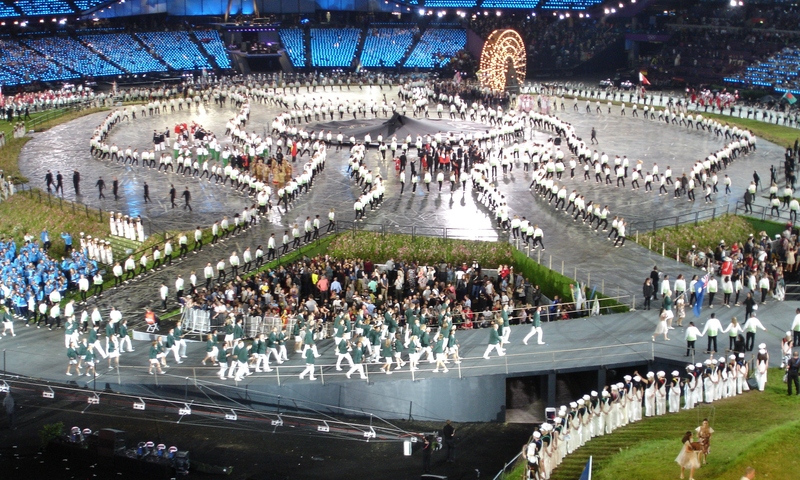 In 2000 I was fortunate enough to be living in Sydney Australia and attend their Olympics. 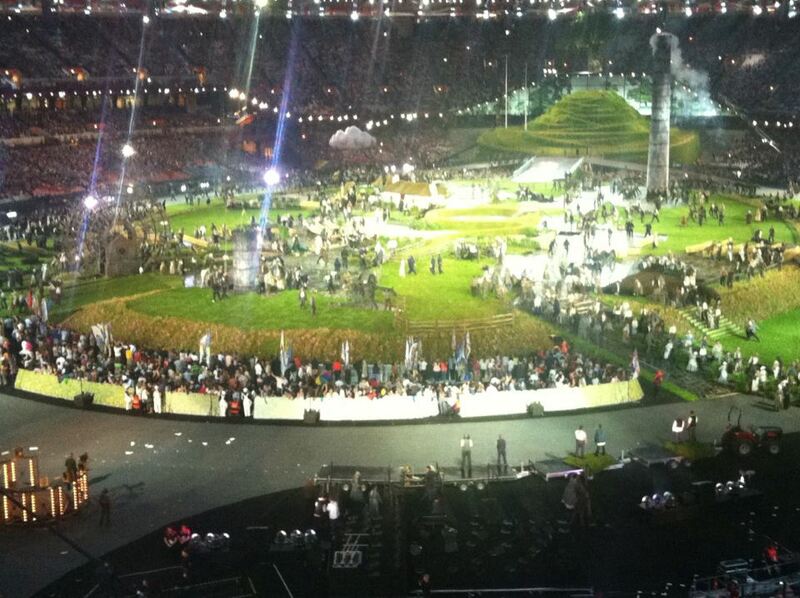 Even there (where they are soooo much more positive) there was negative press and media before the Olympics started. 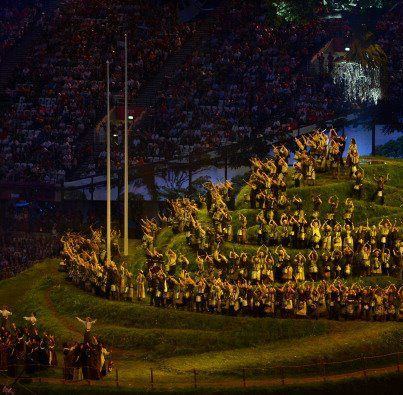 However as we all know now the Sydney Olympics were simply awesome. 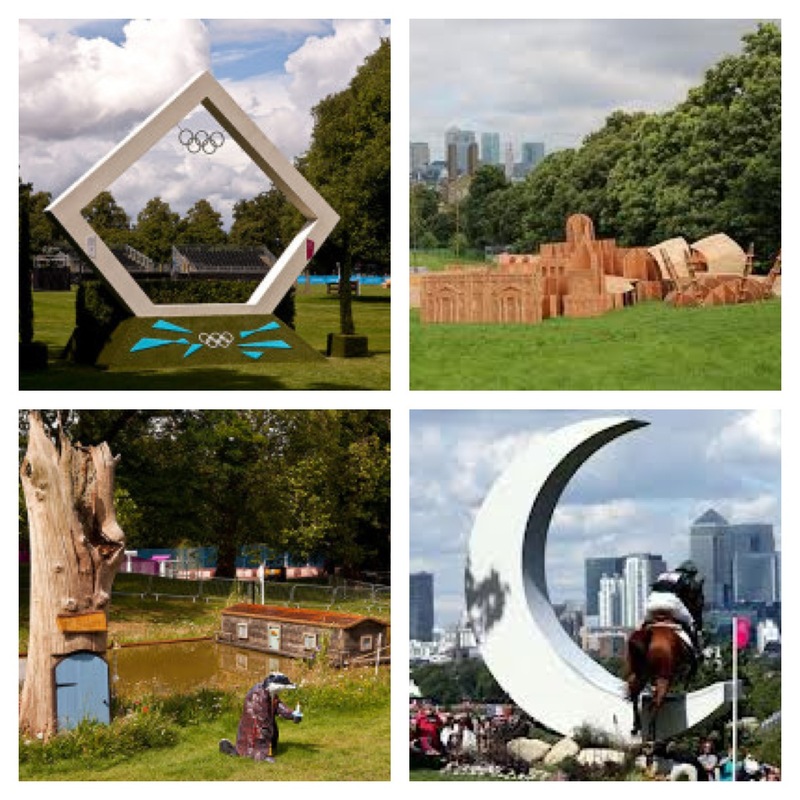 The Olympic village and facilities that remain are used by schools, sports clubs and adults. There’s a legacy of youngsters coming up through the ranks knowing what it means to be a part of the Olympics and I’m quite sure in London this year, we will feel their drive and enthusiasm as the Aussies reach for gold. In Sydney, despite only getting a couple of tickets via their ballot, I was able to attend 8 events in the end as guests of others or buying tickets from friends who didn’t want or couldn’t then go. I didn’t mind. I was happy to go to as many events as I possibly could. Each of them were amazing for so many different reasons. The location. The sport. The laughter. The inspiration. Now I just need to work out the logistics in picking up and dropping off my nephew and niece who will be joining me for two of the three events. 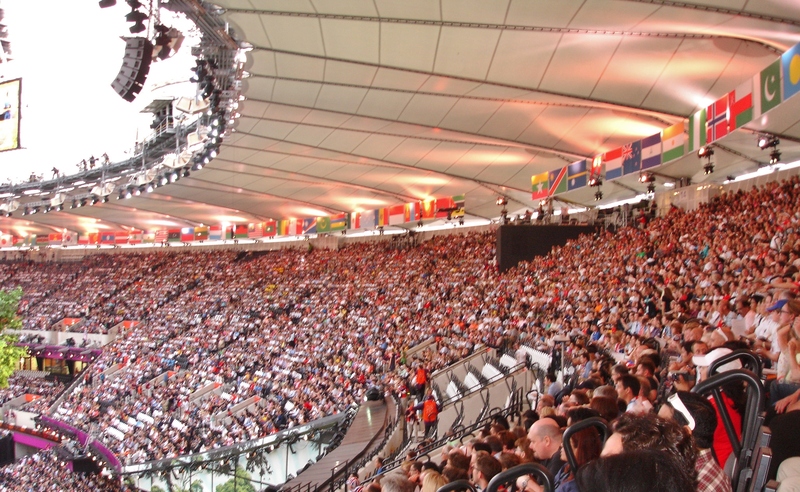 If you’ve got the chance to get to the Olympics or Paralympics, whether it be at the event itself or watching it on a big screen with others, please please please do it. PS Oh and if there’s anyone reading this that has a spare ticket to ANYTHING, I’m your gal!